344. Alexander Radclyff to Cromell. By Cromwell's means is farmer of the parsonage of Eccles with all lands lately belonging to the house of Whalley in the parish, but Sir Wm. Leylande has lately made labour to Mr. Pollarte, surveyor, and obtained a similar grant from him, and depends on the favour of the lord Admiral. Asks Cromwell to help him. Ordessalle, Lancashire, 26 July. Signed. As Sir Thomas Tempest is sending up the bearer his servant, begs Cromwell to be good lord to the said Sir Thomas, and also to Sir Ralph Ellerker and Robert Bowes who are now here. Each of them is at more charges than his fee will bear, and they should be encouraged to take pains. Sheriff Hutton, 26 July. Signed. P. 1. The latter part in Norfolk's hand. Add. : Lord Privy Seal. Endd. 346. Sir Thos. Clifford to Henry VIII. The king of Scots since his return from France, omitting all pastimes, has been getting ready his ordnance at Dunbar, Temptallow and other places, and now for a month past has twice a week visited Dunbar with a privy company at 12 o'clock at night, continuing there one day or two, and returning by night again. Begs the King to consider the dangers of this town, which is destitute of victuals and gunpowder, and the walls in great ruin. 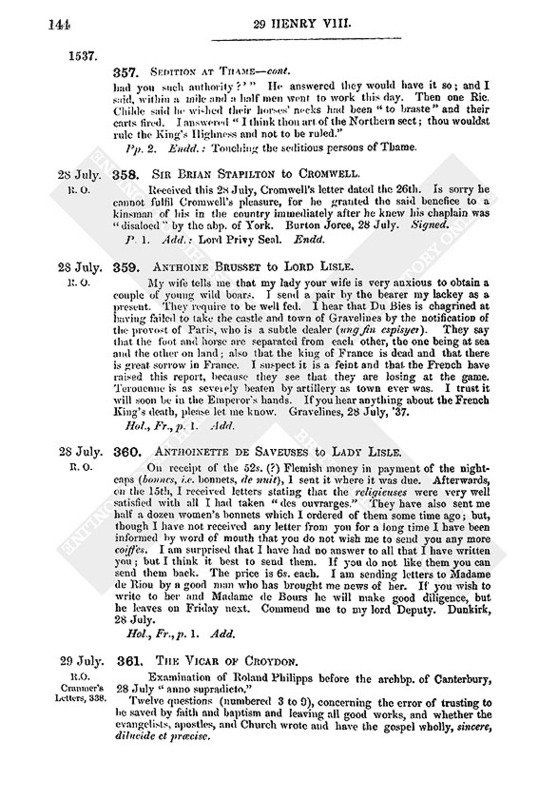 Desires letters to his subjects in Yorkshire, Durham and Nthld. to repair hither upon warning. On Saturday 14th the master of Forboose, son and heir to the lord Forboose, was attainted of treason for matters of which he declared at his death he was "sackelese." He was that day beheaded and quartered in Edinburgh. On Tuesday following Lady Clams (Glammis) sister of the earl of Angus, was burnt in Edinburgh for treason. There remain in ward the lord Forboose, William Forboose, his cousin german, the lord Clams, the laird of Wedderburn, &c. (named). Berwick, 26 July. Signed. 347. Sir Thos. Clifford to Cromwell. Has advertised the King of the disposition of James V. since his return from France. Sends a copy of his letter with a bill of necessaries for fortifying Berwick. Berwick, 26 July. Signed. Pp. 2. Add. : My lord Privy Seal. Endd. by Wriothesley. 348. Sir Geo. Lawson to Cromwell. Has received his letter this 24th inst. "for the diffalcation of certain pensions in these parts," which he will accomplish according to the King's command. Desires instructions for the repairs at Berwick and Wark Castle. Has given orders for the repair of the King's two brewhouses and bakehouse at Holy Island, which are in sore decay, one side of them like to fall. Berwick, 26 July. Signed: "Your hearty man ever, George Lawson." 349. Sir Robert Wingfield to Cromwell. Wrote last on the 23rd forwarding a letter of his nephew Hall written the day before. Sends another of his written on the 24th, before Torwan, which has not come so speedily as he hoped. Calais, 26 July 1537. 350. J. de Morbecque to the Deputy of Calais. I am to-day informed that one of my compaignons de guerre, sworn to the Emperor, has been taken by the French within your Pale. His name is Clay Nendz. Tournehen Castle, 26 July. Signed. 351. John Hutton to Cromwell. The commissioners who met at Bommy have gone home without concluding anything. Their meeting was much grudged at by those of the camp who feared a peace or at least a truce was treated; so that Molumbeis and Lekirke came not to the camp without great danger till it was manifest by the shooting of the ordnance that nothing was concluded. Many breaches have been made, and it appears they intend an assault in several places. The Almains had won the first entry by lot but have resigned it to Isselstein at his request. "I pray Jesu speed him well, for he is a very forward gentleman." The assault is expected to be given tomorrow. If it be "I will give them the looking upon." The lord of Peyn is to be exchanged for the seneschal of Hainault. The camp before Turwyn, 26 July. 352. Mines in Devon and Cornwall. 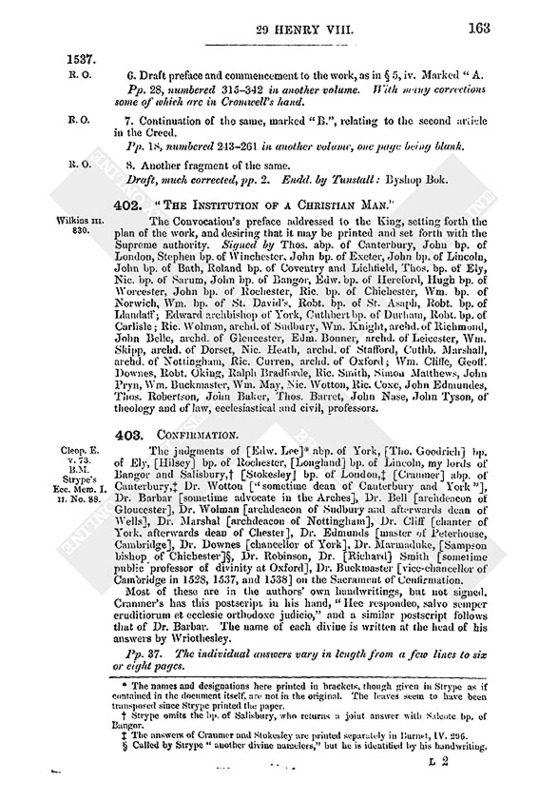 Deed poll whereby Thomas Marshall, George Warner, Wm. Torner, Hugh Ellis, Thos. and Alex. Payn, Ralph and Nic. Baynebrygge, and the other commissioners for the survey of mines in Devon and Cornwall appointed by patent 1 Aug. 14 Henry VIII., appoint Nic. Caldecotte alias Calcote of London, mercer, as clerk controller and overseer of the work. Dated 26 July 29 Henry VIII. Large paper, pp. 4, with a memorandum endorsed for an additional clause. 353. Rumors in the North. "The saying of Cuthbert Richardson of Durham afore my lord of Westmoreland touching the reckless words spoken by Sir John Peersoun, priest, of Corpus Christi Guild within Durham" on 27 July 29 Henry VIII. The accused came to a butcher's stall in Durham named Richard Dawson, and in presence of the foresaid Cuthbert and Richard said he could tell them news. And being asked what news, said the King and his Council had devised that every gentleman who was at Doncaster road in the time of the commotion should pay a year's rent of his lands to the King, every yeoman 100s. and every commoner that sent forth a man as much as they gave at the man's setting forth. Then the said Cuthbert said to him, "Farewell Mr. Parson, ye have said well." 354. John Rokewood to Lord Lisle. See Vol. XI., No. 171, which seems to be of the year 1537, as Du Bies went with the French army into Italy in the spring of 1536. 355. Sir Clement West to Henry VIII. Prince Doryo has gone from Myssyn towards … ..,and intends "to cut the tayle off [the Turk's] armad." The viceroy of Sicily's news of the captain of Brend ... and Barbarossa. The brigantine sent from hence saw 400 sail of Turks between Corfu and the Izsell. News brought by a Saragoze ship which escaped from the Turks at Negropont. Hears from Venice than "Don Farnande has rec .... yn Hongre." Speaks of 40 sey[le](? ) of Portugal. The rest is mutilated but seems to import that he has received Henry's letters in his favour to the master and council of the Order and that he is entirely bound to him for former favours, as Slebech, protection from Sir Ryse and Sir Griffith, delivery from prison, &c. Malta, 27 July 1537. Hol., pp. 2. Mutilated. Begins: Most high and mighty prince. 356. Sir Ralph Eure [Jun.] to the Duke of Norfolk. Has been with my lord Privy Seal and seen the letter which is very craftily forged in his name; but disowns all knowledge of the making of it. His Lordship said on Thursday that he referred the examination of the matter to Norfolk. Windsor, 28 July. Signed. On Whitsunday at breakfast, in the chantry of Thame it was said, touching the state of the North, that 10 should suffer as "proditors," among them lady Bulmer. Robt. Jons said it is pity that she should suffer. John Strebilhill said "it is no pity, if she be a traitor to her prince. Jons said "Let us speak no more of this matter, for men may be blamed for speaking of the truth." Signed by Strebilhill. Thos. Tyler, sworn and examined, confesses as above. The above confessions made before Sir John Daunce, 27 July, 29 Hen. VIII. (1.) Of John Strebilhill, taken 26 (?) July 29 Hen. VIII., stating that Rob. Johns of Thame as he came from the latter evensong on Sunday three weeks before Whitsuntide told him he feared the King would have the crosses and jewels of their church, and proposed to sell the jewels as the church was in decay. These words deponent showed to his father Thos. Strebilhill on Friday following Whitsuntide week. Signed. (2.) 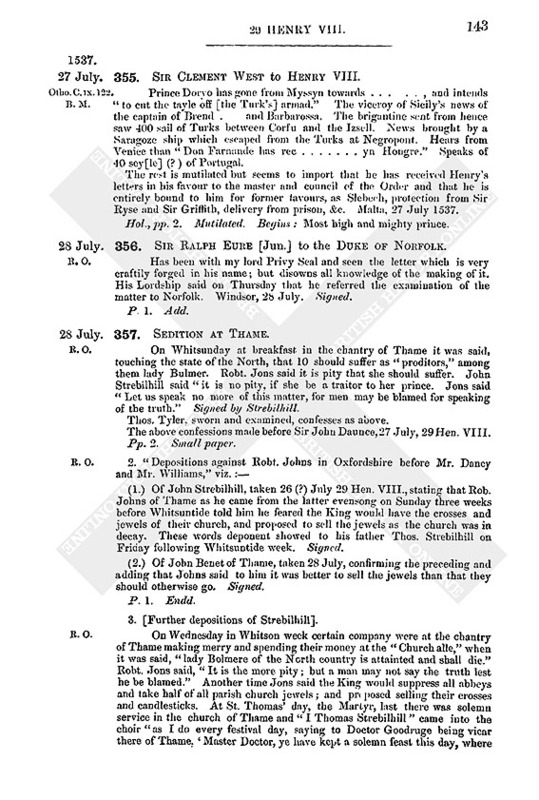 Of John Benet of Thame, taken 28 July, confirming the preceding and adding that Johns said to him it was better to sell the jewels than that they should otherwise go. Signed. 3. [Further depositions of Strebilhill]. On Wednesday in Whitson week certain company were at the chantry of Thame making merry and spending their money at the "Church alle," when it was said, "lady Bolmere of the North country is attainted and shall die." Robt. Jons said, "It is the more pity; but a man may not say the truth lest he be blamed." Another time Jons said the King would suppress all abbeys and take half of all parish church jewels; and proposed selling their crosses and candlesticks. At St. Thomas' day, the Martyr, last there was solemn service in the church of Thame and "I Thomas Strebilhill" came into the choir "as I do every festival day, saying to Doctor Goodruge being vicar there of Thame. 'Master Doctor, ye have kept a solemn feast this day, where had you such authority?'" He answered they would have it so; and I said, within a mile and a half men went to work this day. Then one Ric. Childe said he wished their horses' necks had been "to braste" and their carts fired. I answered "I think thou art of the Northern sect; thou wouldst rule the King's Highness and not to be ruled." Pp. 2. Endd. : Touching the seditious persons of Thame. 358. Sir Brian Stapilton to Cromwell. Received this 28 July, Cromwell's letter dated the 26th. Is sorry he cannot fulfil Cromwell's pleasure, for he granted the said benefice to a kinsman of his in the country immediately after he knew his chaplain was "disaloed" by the abp. of York. Burton Jorce, 28 July. Signed. P 1. Add. : Lord Privy Seal. Endd. 359. Anthoine Brusset to Lord Lisle. My wife tells me that my lady your wife is very anxious to obtain a couple of young wild boars. I send a pair by the bearer my lackey as a present. They require to be well fed. I hear that Du Bies is chagrined at having failed to take the castle and town of Gravelines by the notification of the provost of Paris, who is a subtle dealer (ung fin espisyer). They say that the foot and horse are separated from each other, the one being at sea and the other on land; also that the king of France is dead and that there is great sorrow in France. I suspect it is a feint and that the French have raised this report, because they see that they are losing at the game. Terouenne is as severely beaten by artillery as town ever was. I trust it will soon be in the Emperor's hands. If you hear anything about the French King's death, please let me know. Gravelines, 28 July, '37. 360. Anthoinette de Saveuses to Lady Lisle. On receipt of the 52.s. (?) Flemish money in payment of the nightcaps (bonnes, i.e. bonnets, de nuit), I sent it where it was due. Afterwards, on the 15th, I received letters stating that the religieuses were very well satisfied with all I had taken "des ouvrarges." They have also sent me half a dozen women's bonnets which I ordered of them some time ago; but, though I have not received any letter from you for a long time I have been informed by word of mouth that you do not wish me to send you any more coiffes. I am surprised that I have had no answer to all that I have written you; but I think it best to send them. If you do not like them you can send them back. The price is 6s. each. I am sending letters to Madame de Riou by a good man who has brought me news of her. If you wish to write to her and Madame de Bours he will make good diligence, but he leaves on Friday next. Commend me to my lord Deputy. Dunkirk, 28 July. 361. The Vicar of Croydon. Examination of Roland Philipps before the archbp. of Canterbury, 28 July "anno supradicto." Twelve questions (numbered 3 to 9), concerning the error of trusting to be saved by faith and baptism and leaving all good works, and whether the evangelists, apostles, and Church wrote and have the gospel wholly, sincere, dilucide et præcise. 29 July.—Four questions (10, 11, 12, 15) in the answers to which he denies that the people have been mistaught these 500 or 600 years. 28 July.—Questions 17 to 22. Says that the bp. of Worcester and Dr. Crome exclude all bodily religious observance as frivolous and vain, that some great men in the Court at mass clap their finger upon their lip and say never a word; and that the Scotch friar Maydewell damns all singing and reading and organ playing. 29 July.—Three questions, one numbered 23, about tithes and offerings. 28 July.—Five questions (24, 26, 27, 30, 31) as to whom he knew who said that they knew not what material churches served for, but to keep off the rain or to buy and sell in; and that men should not pray because God knows their thoughts already, &c.
29 July.—Five questions referring to the same topics as Question 5 with more elaborate answers. 362. John Whalley to Cromwell. The bearer, a man of Germany, has letters to the King and Cromwell. As he knew not where the Court was and could not speak English he desired to be conducted to you. On Friday morning last the Pawncey of Dieppe, a ship of 13 score [tons], and a little bark look before Calais three hulks, of 12 score and 300 apiece laden with sail:, and a Portuguese ship of 100 tons laden with spices and carried them clean away; which ships we in Dover saw in sight. Begs that Cromwell and the King may write in his favour for Blackwell Hall to the mayor and aldermen of London. Dover, 29 July. Hol., p. 1. Add. : To, &c. the lord Cromwell and lord Privy Seal, at the Court. 363. John Whalley to Richard Cromwell. Begs him to procure access to his uncle for the bearer, a German who has brought letters from the great men of Germany to the King and Cromwell. He loves my Lord well and I have sent one to conduct him to Court as he speaks no English. Secure a lodging for him while he follows the Court, and at his return from Germany again after he has the King's answer he will bring you some pleasure. Remember my uncle the water bailey of Calais's bill and your Turkey horse shall be sent you shortly. Remember also my letter for Blackwell Hall to be signed and my master's letter for the same to the mayor. Begs him to help a poor man's suit to my lord for 30 crowns taken from him by the searcher of Calais, who knew not the custom, but he might have carried them. He will give you 40s. if he can recover them. Dover, 29 July. In four or five days I intend to be with my master. 364. Charles Duke of Suffolk to Henry VIII. Will use diligence in pursuance of the King's letters to put in execution the commission of sewers and the statute of vagabonds in Lincolnshire. Cannot perceive but that the whole country is sorry for their offences against his Highness in times past and anxious to recover favour. Erysbye, 29 July. Signed. 365. Sir Will. 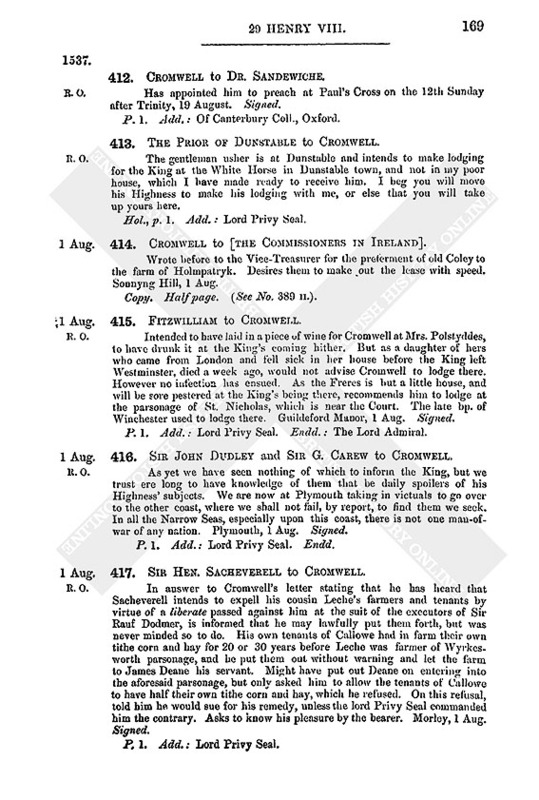 Fayrfax to [Cromwell]. Will fulfil the King's commands and Cromwell's about the delivery of the earl of Northumberland's goods taken by way of distress for a debt of 82l. to the King. Is sorry to hear from his servant's report that Cromwell thinks him a dissembler. Is ready to justify himself against any accuser. Last time he saw Cromwell, Cromwell promised him his favour touching the ullnership of Yorkshire. Does not know anything he has done amiss except forbearing to pursue his complaint in the Star Chamber against Thos. Gris, which was owing to the interference of the duke of Norfolk when it was announced that the King would be merciful. Relates the circumstances. 29 July. 366. [Hall] to Sir Robt. Wingfield. Wrote lust on Friday and afterwards received Wingfield's by Robyn the lackey. St. Omer's gate is sore beaten (particulars given), but no sufficient breach is made for the assault. A great pane of wall is beaten down on this side between the Red Bulwark and the next bulwark towards the river, but the rampart remains upright and high, so that the town is not "sawtable" there without filling the ditches. Yesterday artillery was laid on the foreside of the river and sore beat that flank and rampart, and a false assault was made after dinner. And being on the other side of the river with divers noblemen and gentlemen, where was also my cousin John, who returned that night to St. Omer, with Hutton the King's ambassador, we could see the French to be in such readiness that they had already lighted their fire hard by the walls. Various details of the foresaid alarm. It is expected the assault will be given to-morrow indeed, and that the bridge or engine shall be approached. Cannot believe that it was deferred, as some say, to have the seneschal of Hainault first delivered out in exchange for Mons. de Peans, for the herald that came on Friday was still here last night, and also the abbot beside Cambray, whatever the matter means. This morning we were early in harness and all the High and Base Almains ranged to march in battle against the power of France which was bruited to be coming, but as there was no such thing every man returned. To-day we rest and do little as it is Sunday. Yesterday morning Mollenbais told me with great vehemency that at the conference at Bomme he and Lyekerk carried the French articles to the Queen and Council at St. Omer's, who agreed to them, but that the French would not abide by their own offers. Comments severely on the conduct of the French. Yet since it is known that there is no French power near, our abbot has got Mollenbais to Bomme again, where it is said the French ambassadors were last night, so that a truce is expected. Before Turwan, Sunday, 29 July 1537. In Hall's hand, pp. 4. Add. 367. John Hutton to Cromwell. Last night a false alarm was given to the town of Turwyn by 50 handgunners of Istilstein's band, to make the townsmen come upon the walls, against which were laid 6 long serpentines to scour the flanks of the walls on the south side. These pieces were plied for 3 hours, with what effect within the town is yet unknown; "but those 50 have paid their privy tithes so well that a great part of them were sent either to Heaven or to Hell." The same night there was an alarm in the camp that 7,000 foot and 3,000 horse of the French were coming to succour Turwyn, and all the army were in battle till 7 this morning. This I think will prevent the assault being given to-day as ordered. There will be hot work, for those within show no fear, but revile the besiegers, calling them heretics and bidding them go to Peronne. This enrages the lanceknights, and if the place be taken few or none will escape. They have made great breaches, but there is little provision to fill the ditches; and unless they give the assault shortly, they will have to retire for lack of money. If they win Turwyn, however, Flanders, Artois, and Hainault will contribute as much as they can. Molembes is gone to Boommy. An abbot whose abbey is neutral takes much pain to bring the commissioners together. Many slain in the camp by the townsmen, but not a tenth part so many as would be if they used the ordnance. It is thought their powder is scarce. St. Omer's, 29 July. Hol., pp. 3. Add. : Lord Privy Seal, at the Rolls. Endd. 368. Henry VIII. to Gardiner. Has received his sundry letters. Thanks him for the answers he made touching the pretended conclusion of marriage between the Infant of Portugal and the Lady Mary. If asked further about the matter, he may state that it is neither agreed upon, nor in any towardness. Is sending Henry Knevet, one of the gentlemen of the Privy Chamber, to visit the French King, report what state he is in, and the condition of affairs there. He will confer with Gardiner. Sunninghill, 30 July. Signed and sealed. P. 1. Add. Endd. Sent Mr. Wodall to get the money delivered by the vicar of Halifax after Easter last, which was found hidden in a pot underground in his house during the rebellion, with the vicar's letters to such as he delivered the same to; of which Sir Henry Savell has 400l., and has left it with his evidences at London in the custody of Broke of the King's Head. Has himself received 200l. which was in two other men's hands, but as yet can get no more. The vicar says he has spent the rest, but Norfolk expects soon to get 100 marks more restored, in addition to the 800l. Sends interrogatories ministered to the vicar and his answer, with the depositions of him that found the money under a stair, and a bill of Mr. Wodall's of his proceedings. Most of the Council believe the money to be the vicar's, and not treasure trove, for these reasons:—1. There were many crowns of five shillings—a coin not used much before he was vicar. 2. He made one man and one woman privy that he had hidden it there. 3. Sir Henry Savell says he had 800l. of his in keeping before; and though his saying might be feigned as well as that of the woman, who is his sister, and the man, who is his nephew, the being there of the crowns is in his favour. Has laid to his charge that he has not contributed to the King after his substance, living covetously like a man of 40l. promotions, when he can spend 200l. a year. He is also a troublous and busy man among his neighbours, having at the assises two nisi prius against others and one against him. Desires instructions as to proceeding further. Sheriffhutton, 30 July. P.S.—George Douglas has arrived coming towards his Majesty. By him you will learn such news as be in Scotland. His friends are so hardly handled, I think I have surer espial there than he. I have this day received a letter from your lordship with two bills in print, wherein I shall do my best devour. Signed. Pp. 2. Add. : Lord Privy Seal Endd. 2. Interrogatories ministered by my lord Lieutenant on behalf of the King against Master Doctor Hallisworthe, vicar of Halifax. (1.) First, what money ho received by means of his parish priest, Sir Alexander Emott, discovered by confession? (2.) When and where he received it and in what coin? (3.) Who first found it, and where and how it was hid? (4.) How long it lay hid before it was found? (5.) Who was of counsel with him, and how many persons knew of the hiding of the said money? (6.) Why he hid it, and whether it was ever hid in other places, and where, and who was privy thereto? (7.) How long he has been owner of this money? (8.) How he came by so great a sum? (9.) How long it was found before he wanted it? (10.) How he first knew it was found, and when? (11.) How long after he knew it had been taken he kept it secret or made any other privy thereto? (12.) Whether he knew of its taking when he was in York about Mid Lent with my lord Lieutenant? (13.) Whether he then knew there was open proclamation made by my said lord for restitution of all spoils committed during the rebellion? (14.) Why he did not then complain to my said lord, seeing that all spoils then complained of were redressed? (15.) If ever he removed the said money after he hid it, and who was privy thereto? (16.) Whether he knew the exact sum? 3. "The answer made by me Robert Haldisworthe vicar of Halifax to the interrogatories ministered by the right honourable lord duke of Norfolk, lieutenant to the King's Highness," 21 July 1537. 1. I received by the hands of Sir Alexander Emett my parish priest at Halifax 789l. 8s. 9d. which he says came to his hands by confession. 2. I received it 3 or 4 days after Low Sunday last in a parlour within my vicarage, all in gold. 3. I heard but now of late that Thomas Lacy of Halifax found the said money under a stair beside my parlour. This was how it was hid. I put it in a little brass pot and put a little box and writing therein containing the true sum of the gold and set it in the earth so that the pot's "brims" were even nearly with the earth outside and a little "moylle" or dust and small chips thereupon, and also other great chips. 4. The money lay there from Easter next before the rebellion till the time of the rebellion. 5. Thinks he showed Sir Henry Savell of the hiding thereof and the place, and wrote afterwards to him about it; also to his sister Agnes the wife of John Mawde, and her son Edward, of Halifax. 6. His reason for hiding it was because John Lacy, son-in-law to Sir Ric. Tempest and steward of Wakefield, did riotously spoil his goods and cattle from his vicarage in the month of March before the rebellion. 7. Was owner of that money only at that time and a little before, for he had gathered it together at sundry times. 8. His father, John Hauldsworthe of Halifax, bequeathed to him at his death money and goods of nearly 1,000 mks, value to find him at the school of Oxford and beyond sea, and the remainder to keep at his pleasure. Also his mother gave him all her goods, and they left him certain lands in patrimony for life. 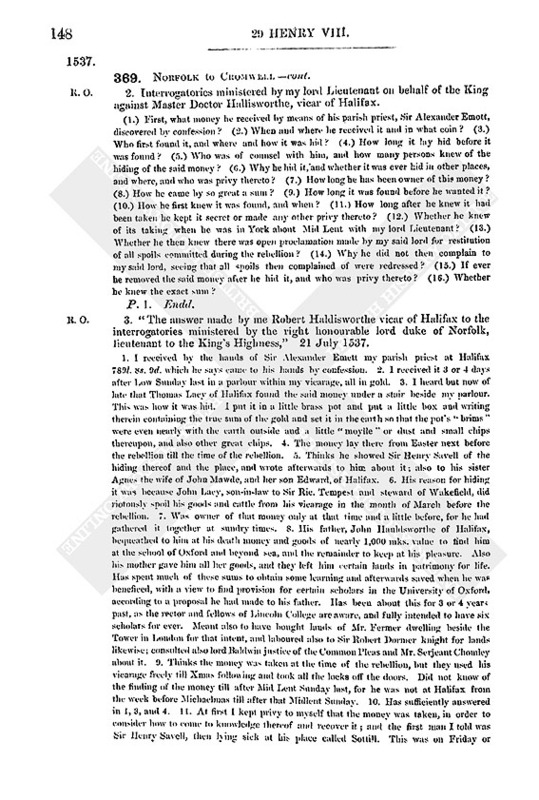 Has spent much of these sums to obtain some learning and afterwards saved when he was beneficed, with a view to find provision for certain scholars in the University of Oxford, according to a proposal he had made to his father. Has been about this for 3 or 4 years past, as the rector and fellows of Lincoln College are aware, and fully intended to have six scholars for ever. Meant also to have bought lands of Mr. Fermer dwelling beside the Tower in London for that intent, and laboured also to Sir Robert Dormer knight for lands likewise; consulted also lord Baldwin justice of the Common Pleas and Mr. Serjeant Chomley about it. 9. Thinks the money was taken at the time of the rebellion, but they used his vicarage freely till Xmas following and took all the locks off the doors. Did not know of the finding of the money till after Mid Lent Sunday last, for he was not at Halifax from the week before Michaelmas till after that Midlent Sunday. 10. Has sufficiently answered in 1, 3, and 4. 11. At first I kept privy to myself that the money was taken, in order to consider how to come to knowledge thereof and recover it; and the first man I told was Sir Henry Savell, then lying sick at his place called Sottill. This was on Friday or Saturday before Palm Sunday last, in my coming from York. Afterwards told my sister Agnes Mawde and Edward her son and Sir Alexander my parish priest. 12. Knew, before his coming to York in Passion week last, of the taking away of the said money. 13. I came to York in Passion week to my said lord's grace for his favour that such process as I had obtained by the King's Council might be served against those who had robbed and spoiled my vicarage at Halifax in Lent before the rebellion and likewise at the time of the rebellion. At that, time your Grace showed me that restitution of spoil might be made by you; and Sir Brian Hastyngs, sheriff of the shire, did show your Grace the precept that was sent to him, which your Grace kept for a time and afterwards re-delivered to the sheriff. And after that he told me he would set us at a good end, and, if he could not, he would execute the writ of attachment against them. 14. I did not sue to your Grace for restitution because I had put up a bill of complaint to the King and Council at Xmas last and obtained writs of subpœna for them to appear above before your Grace's coming; for it had been of less cost and easier for me to have had restitution by your Grace's command. 15. Never removed the money from the place. Thinks he showed Sir Henry Savell the amount, and showed his sister Agnes and nephew Edward the place, and said there was a great sum of gold in the pot. 16. When I hid the gold I was certain of the sum thereof, for I wrote it on parchment and put it in a little box and hid it above the gold in the said pot. Also I wrote the sum in my book in figures of "augryme." Howbeit, at the receiving now lately of part thereof I doubted what was the true sum and bad to refer to my book. 4. Deposition of Thomas Lasse. That he found a pot of brass of a gallon with gold, what sum he knew not, but the pot was near full of earth and gold and covered with a trencher lid. The top of the pot was a good handbreadth under the ground and the earth over it was meetly hard. Put the gold in a pepper poke of canvas which would hold a pound of pepper, but the gold did not fill it by two fingers' breadth. Declared the finding of the gold to his ghostly father the first week in Lent, and by his advice kept it till Low Sunday. And two or three days after that he brought it to his ghostly father's chamber in the said bag and thence to the vicarage, where he put it over the court wall and left it. Reserved to himself 67l. which he delivered to Sir Alexander Emote, Sir William Saltonstalle and Sir Thomas Michell, priests, about 14 days after Low Sunday. Had given him some wood which lay under a pair of stairs in the hall of the vicarage by the vicar's parlour, and after taking away the wood, as he had heard that Dr. Hallesworthe was wont to hide money in the ground, he took a piked staff and struck into the ground and at the first stroke hit the pot. Took the money home in his sleeve. Further examined; he found in the pot a piece like to a skin of a finger's length all rotten, but neither box nor writing. Further: he spent 26s. 8d. of the money about his seeding, but all the rest is restored as before expressed. Pp. 2. Endd. : Depositio inventoris. 5. Account of the demeanour of John Uvedale, lately sent by my lord Lieutenant to Halifax, in getting into my Lord's hands the sum of 800l. found hid in the earth in the vicarage there in a brazen pot under a stair by one——Lascy in the time of the late rebellion; which money Dr. Hauldisworth, now vicar there, claims as his own. 1. My lord Lieutenant wrote his especial letters to Sir Rob. Nevyll and Robt. Chaloner, dwelling near Halifax, to assist the said John for knowledge of the truth in the premises and to get the money into my said Lord's hands. 2. After delivery of the letters, as there was some unkindness between the said Sir Robert and Sir Henry Savell, to whom the said John was principally sent, it was thought good to Uvedale and Chaloner that he should not personally repair with them to the said Sir Henry. 3. Uvedale and Chaloner therefore went to Sir Henry, who entertained them kindly at his manor of Thorney. And before delivering him my Lord's letters they said they were commanded by my said Lord to ask him certain questions in matters which touched the King, and desired he would answer as if sworn upon a book; which he said he was willing to do, and did, as appears by his examination signed by his own hand, and by the delivery of six several letters sent to him at divers times from the vicar of Halifax, which he had then ready in his bosom to deliver. Made a mark on the back of one of them in which mention was made of the money hid. After this they delivered to him my Lord's letters to which, as regards the delivery of the money in his custody, he answered as appears in his examination. 4. This day at the coming of the said Uvedale and Chaloner to Sir Henry's house they found with him one Ric. Listar of Halifax kinsman to the said vicar who had 86l. in his keeping, part of the said money, which was delivered to him by the said vicar. 5. (Second leaf, found apart). "On the next morning the said John and Robert, taking their leave of the said Sir Henry, rode from thence to the foresaid Sir Rob. Nevell, making him privy unto all the premises (saving unto the said six letters of the vicar); and then the same Sir Robert, John Uvedale, and Challoner rode unto Halifax, where they examined Agnes Mawde, sister to the said vicar, upon the said articles." Her deposition appears by her confession to each article severally, and she went, at their request, to the vicarage, and showed the place under the stair where the pot and money were hid. On their return, her son, John Mawde, came in from the said Sir Henry Savell's place, with whom he did not speak, as he was not at home. Finally examined John Mawde, who answered to each article, as appears in his confession, and acknowledged 145l. delivered to him by the vicar, of which he laid out 20l. on his own business. "All these premises were of this sort, in manner and form before expressed, used and practised by the commandment of my said lord Lieutenant, the 21st, 22nd, and 23rd day of July Ao 29 Hen. VIII. ; at the doing whereof the said John Uvedale was personally present always. In witness whereof he hath subscribed these premises with his own hand," 30 July 29 Hen. VIII. Signed: Jo. Uvedale. In Uvedale's hand, pp. 3. Endd. : Gesta Mag. Uvedale. 1. If they ever knew of any great sums that the vicar of Halifax had? 2. If they ever saw any money of his in gold, silver, or any other strange coin? 3. How many years it is since they knew of it first? 4. If they knew in what place he kept it, and how much there was? 5. If they know of the hiding of it in the earth, and where it was hid, and who were present, and how long ago? 6. How long this money now in their hands has remained with them? 7. To demand a book of the said vicar's, now remaining with the said Sir Henry Savell, in which mention is made of the vicar's money, plate, and debts. In Uvedale's hand, p. 1. 370. Sir William Eure to [Norfolk]. I received on the 29th your Grace's letter dated Helmeslay. 24 July. Accordingly repaired to the person specified, and learnt that the king of Scots has sent into France a secretary of the late queen and a Scotch gentleman to know the French king's pleasure. If they agree, then James will take the advice of the French king for his marriage, &c: if not, then that of the King our master. The French men, ladies, and gentlewomen remain in Scotland till they hear from France. The Scots are inclined for peace, though the borderers of both realms would have war. Norham, 30 July. Signed. 371. [Hall] to Sir Robert Wingfield. Wrote last yesterday. This day after dinner Mollenbais and Lyekerk returned from Bomme, and have brought the truce, concluded for 10 months if the Emperor agree to it, which some say may extend to Italy and elsewhere by his consent. One of the French king's trumpets has notified it to the town of Tourwan, and this evening our folks have walked safely round the town upon the dike sides, they within also showing themselves upon the walls. I hear nothing yet of the articles, or of what the French shall yield. The Great Master, the duke of Arscott, and others dislike the conclusion; four times the money that would have won Tourwan will not bring this company together again. Fears those will smart who yielded to French promises. The Queen goes to-morrow from St. Omer to Mountte, Cassel, and so to Bruges. This evening Arscot, the Marquis of Barrow, and the Count Pynoye have gone to St. Omer's, chiefly because their wives are with the Queen. Though we have truce we still keep sharp watch. When the army dissolves I trust to see you at Calais. Tourwan, 30 July 1537. In Hall's hand, pp. 2. Add. Endd. 372. The War in Picardy. 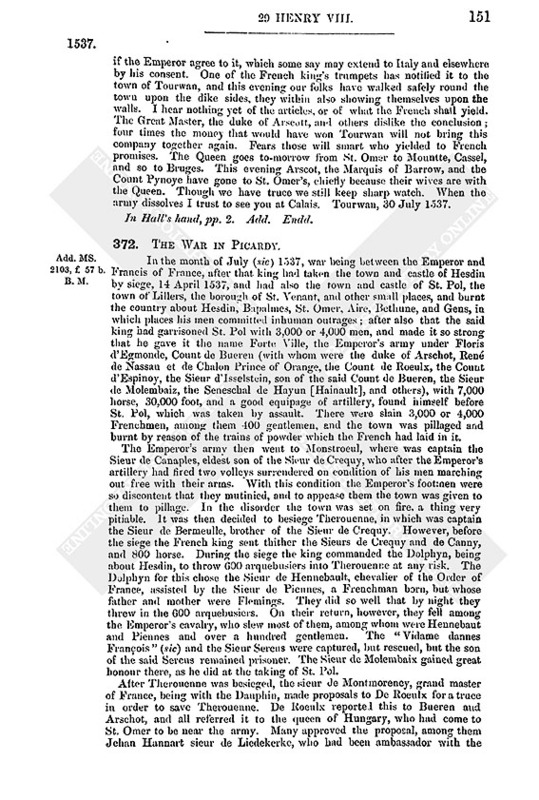 In the month of July (sic) 1537, war being between the Emperor and Francis of France, after that king had taken the town and castle of Hesdin by siege, 14 April 1537, and had also the town and castle of St. Pol, the town of Lillers, the borough of St. Venant, and other small places, and burnt the country about Hesdin, Bapalmes, St. Omer, Aire, Bethune, and Gens, in which places his men committed inhuman outrages; after also that the said king had garrisoned St. Pol with 3,000 or 4,000 men, and made it so strong that he gave it the name Forte Ville, the Emperor's army under Floris d'Egmonde, Count de Bueren (with whom were the duke of Arschot, René de Nassau et de Chalon Prince of Orange, the Count de Roeulx, the Count d'Espinoy, the Sieur d'Isselstcin, son of the said Count de Bueren, the Sieur de Molembaiz, the Seneschal de Hayun [Hainault], and others), with 7,000 horse, 30,000 foot, and a good equipage of artillery, found himself before St, Pol, which was taken by assault. There were slain 3,000 or 4,000 Frenchmen, among them 400 gentlemen, and the town was pillaged and burnt by reason of the trains of powder which the French had laid in it. The Emperor's army then went to Monstroeul, where was captain the Sieur de Canaples, eldest son of the Sieur de Crequy, who after the Emperor's artillery had fired two volleys surrendered on condition of his men marching out free with their arms. With this condition the Emperor's footmen were so discontent that they mutinied, and to appease them the town was given to them to pillage. In the disorder the town was set on fire, a thing very pitiable. It was then decided to besiege Therouenne, in which was captain the Sieur de Bermeulle, brother of the Sieur de Crequy. However, before the siege the French king sent thither the Sieurs de Crequy and de Canny, and 800 horse. During the siege the king commanded the Dolphyn, being about Hesdin, to throw 600 arquebusiers into Therouenne at any risk. The Dolphyn for this chose the Sieur de Hennebault, chevalier of the Order of France, assisted by the Sieur de Piennes, a Frenchman born, but whose father and mother were Flemings. They did so well that by night they threw in the 600 arquebusiers. On their return, however, they fell among the Emperor's cavalry, who slew most of them, among whom were Hennebaut and Piennes and over a hundred gentlemen. The "Vidame dannes François" (sic) and the Sieur Sercus were captured, but rescued, but the son of the said Sercus remained prisoner. The Sieur de Molembaix gained great honour there, as he did at the taking of St. Pol. After Therouenne was besieged, the sieur de Montmorency, grand master of France, being with the Dauphin, made proposals to De Roeulx for a truce in order to save Therouenne. De Roeulx reported this to Bueren and Arschot, and all referred it to the queen of Hungary, who had come to St. Omer to be near the army. Many approved the proposal, among them Jehan Hannart sieur de Liedekerke, who bad been ambassador with the king of France. Finally, the Queen deputed Molenbaix and Liedekerke to confer with the deputies of France, i.e., the Sieur de St. Andre Bourbonnois, chevalier of the Order of France, and the President Poyet, at the village of Bommy, a league from Therouenne. The conference concluded, Mr. Matthew Stric, secretary of the Emperor, and servant of the duke of Arschot, secretly informed M. Laurens Dobliol sieur du Suit, that it was necessary to draw up a truce, and, by command of the duke of Arschot, affirmed he had charge to pray him to send to Liedekerke the copy of the truce which was treated between Madame Margaret, archduchess of Austria, and Madame Louise of Savoy, when the present king of France was prisoner after the battle of Pavia (the copy of which truce is entered above). (fn. n1) Du Sart found it reasonable that the copy should be sent, but strange that neither the Queen, the abp. of Parma, chief of the Privy Council, Arschot, nor any other of the Council wrote of it. He, however, sent the copy to Arschot, and by the same narrative, of the letter of the said secretary Stric, advertised him that at his desire he sent it. He added that in the year '25, the King being a prisoner, there was nothing to fear from the French, whereas now it was notorious that they only sought to treat in order to save Therouenne, that experience showed the French could be bound by no promises, that when we dismissed our German soldiers they would probably be taken up by the French, that the French might take occasion of this truce to range all their forces against the Emperor in Italy and join the Turk, who was said to be ready to descend upon the Emperor's countries. Gives numerous other arguments against the truce, which Du Sart also alleged in his letter to Arschot. The copy of the truce and this letter he gave to the said secretary Stric to give to Arschot. Describes minutely the process of the negociations which were thereupon resumed at Bomy, and gives a copy of the truce which was then agreed upon, which breaks off abruptly at the end of the second clause with the words "pourveu que ce ne soit performe de guerre ne d'hostilité quelconque." French, pp. 19. In the same hand as No. 125, and written consecutively with it as part originally of the same book. 2. Fragment in the same handwriting as the preceding narrative, and probably a part of it. 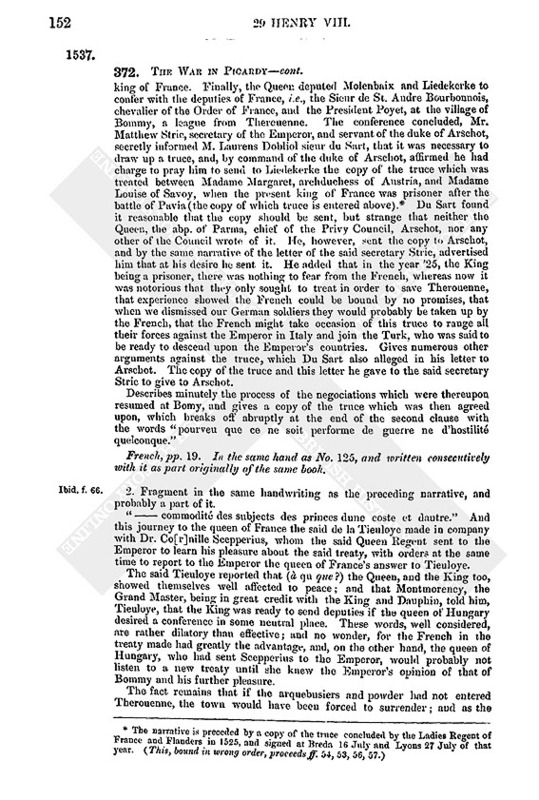 "——commodité des subjects des princes dune coste et dautre." And this journey to the queen of France the said de la Tieuloye made in company with Dr. Co[r]nille Scepperius, whom the said Queen Regent sent to the Emperor to learn his pleasure about the said treaty, with orders at the same time to report to the Emperor the queen of France's answer to Tieuloye. The said Tieuloye reported that (à qu que?) the Queen, and the King too, showed themselves well affected to peace; and that Montmorency, the Grand Master, being in great credit with the King and Dauphin, told him, Tieuloye, that the King was ready to send deputies if the queen of Hungary desired a conference in some neutral place. These words, well considered, are rather dilatory than effective; and no wonder, for the French in the treaty made had greatly the advantage, and, on the other hand, the queen of Hungary, who had sent Scepperius to the Emperor, would probably not listen to a new treaty until she knew the Emperor's opinion of that of Bommy and his further pleasure. The fact remains that if the arquebusiers and powder had not entered Therouenne, the town would have been forced to surrender; and as the Emperor's spies must have known by the fire of the French at Eghuinegate that they were coming, and as they could only get into Therouenne by one gate, that of the Saint Esprit, towards Leable, it ought to have been easy to prevent them. Truce of Bommy taken for ten months between France and Flanders, 30 July 1537. Printed in Leonard ii. 399 and Ribier i. 56. Fr., pp. 5. Modern copy. 374. The Parishioners of All Hallows, Oxford, to the Bishop of Lincoln. In favour of their curate who had been silenced by the bp. Beg that his suspension may be taken off as they believe it ordered on false information "because that he at Mr. Mayor's commandment made a collation to the maintenance of our most noble Prince's dignity and suppression of all his rebels at the general procession made for the Queen's grace's quickening with child." Hopes that he will be permitted to instruct them in God's commandments and the Articles of the Faith, which they regret they were not instructed in sooner. Oxford, 31 July. Signed: Be me Wyll'm Freurs mayer of Oxford.—By me Davy the Pratt, bayly: and subscribed (all in one hand) with the names of Rayfe Shyngoltor and twelve others. P. 2. Sealed. Add. Endd. 375. Cromwell to the Sheriff of Wexford. Received his letters and token by bearer. Has been a suitor to the King and obtained that an Act shall pass in the parliament there for the continuance of "your liberties," Sonnynghill, 31 July. Copy, p. 1. Headed "Copy of the letter sent unto the sheriff of the County of Wexford." 376. Henry VIII. to the Archbishop of Dublin. Has heard of his lightness of behaviour and vainglory. Warns him that if he perseveres in his fond folly and ungentleness, the King can replace him by a man of more honesty. 377. Henry VIII. to the Bishop of Methe. Hears he neglects to instruct the people and to promote the King's affairs. Warns him to look to both. Copy, pp. 3. Headed: To the bishop of Methe. Commission to Ant. Selenger, of Ulcome, Geo. Poulet, Thomas Moyle, and William Berners for the establishment, of affairs in Ireland. (See No. 379.) 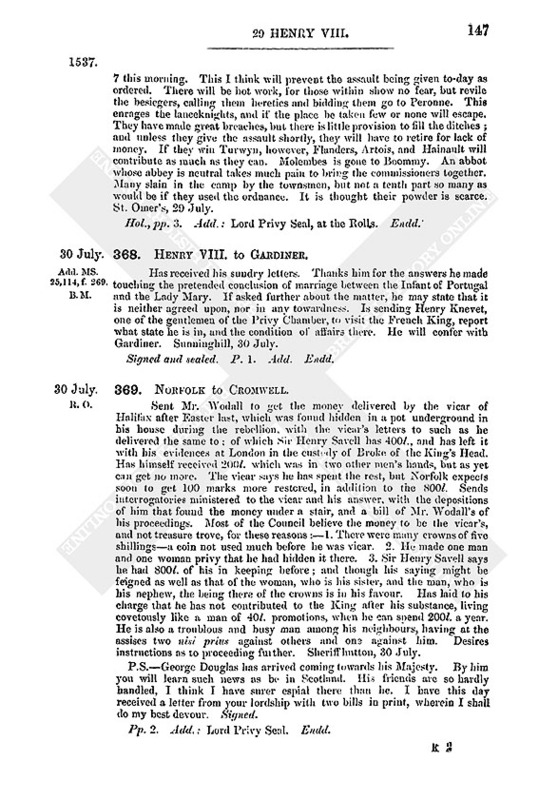 Dated Sonnynghill, 31 July 29 Henry VIII. iii. Commission for letting March lands (see No. 381.) 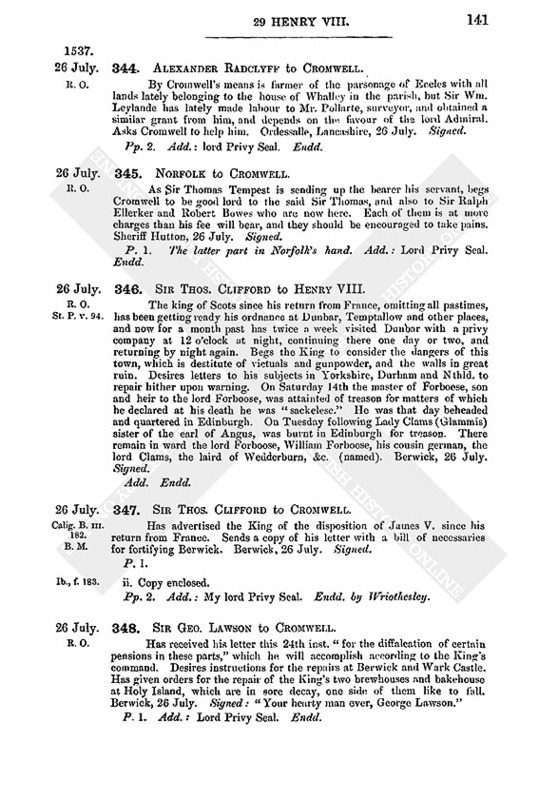 Dated Sonnynghill, 31 July 29 Henry VIII. Commission to Ant. Selenger of Ulcombe, George Poulet, Thos. Moyle, and John (fn. n3) Berners to order affairs in Ireland, commanding the Deputy and Council to assist them. Draft in Wriothesley's hand, pp. 3. 2. Another draft of the same corrected by Wriothesley. 3. 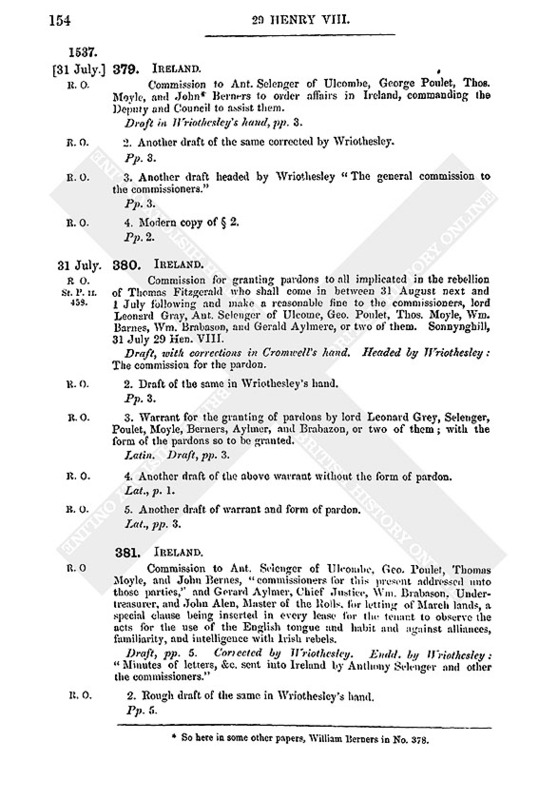 Another draft headed by Wriothesley "The general commission to the commissioners." 4. Modern copy of § 2. Commission for granting pardons to all implicated in the rebellion of Thomas Fitzgerald who shall come in between 31 August next and 1 July following and make a reasonable fine to the commissioners, lord Leonard Gray, Ant. Selenger of Ulcome, Geo. Poulet, Thos. Moyle, Wm. Barnes, Wm. Brabason, and Gerald Aylmere, or two of them. Sonnynghill, 31 July 29 Hen. VIII. Draft, with corrections in Cromwell's hand. Headed by Wriothesley: The commission for the pardon. 2. Draft of the same in Wriothesley's hand. 3. Warrant for the granting of pardons by lord Leonard Grey, Selenger, Poulet, Moyle, Berners, Aylmer, and Brabazon, or two of them; with the form of the pardons so to be granted. 4. Another draft of the above warrant without the form of pardon. 5. Another draft of warrant and form of pardon. Commission to Ant, Selenger of Ulcombe, Geo. Poulet, Thomas Moyle, and John Bernes, "commissioners for this present addressed unto those parties," and Gerard Aylmer, Chief Justice, Wm. Brabason. 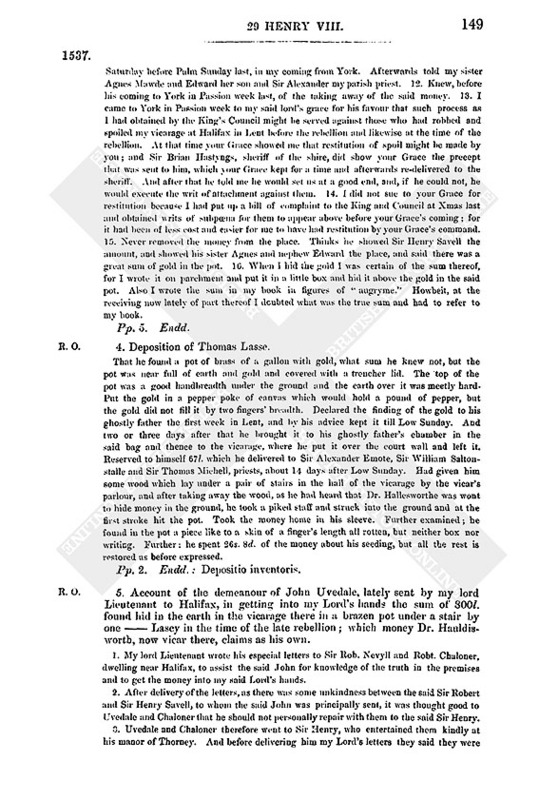 Undertreasurer, and John Alen, Master of the Rolls, for letting of March lands, a special clause being inserted in every lease for the tenant to observe the acts for the use of the English tongue and habit and against alliances, familiarity, and intelligence with Irish rebels. Draft, pp. 5. Corrected by Wriothesley. Endd. by Wriothesley: "Minutes of letters, &c. sent into Ireland by Anthony Selenger and other the commissioners." 2. Rough draft of the same in Wriothesley's hand. Instructions to Ant. Sentleger of Ulcombe, George Poulet, Thos. Moyle and Wm. Berners, whom the King sends" at this time" into Ireland. First to enjoin the Deputy to summon the Council, before whom they shall declare their commission, which is to examine into the demeanour of all officers whatsoever, survey the revenues, and establish order for the quietude of the country. They shall then go to specialties, inquiring whether the Deputy has, as he ought to have, pledges from the Irishmen who might make trouble at the discharge of the retinue, and, if so, give the King's order for discharge of all but 340 picked men, who are to attend the Deputy and treasurer and garrison fortresses (numbers for each given). Wages of soldiers. Thos. Agarde, the Treasurer's clerk, brings the necessary money. Men to be discharged honestly, so that they shall not grudge or murmur. They shall then make an estimate and classified book of the revenues, view waste lands and let them to suitable tenants, and write to the King how best to maintain them. They snail reform all abuses in the King's Courts. Divers Acts are drawn up and delivered to the commissioners to be passed in the Parliament there, i.e., Acts touching proctors of Convocation, bp. of Rome's power, first fruits, defence of marches, liberties of Weysford, English dress and language, alliances with wild Irish arid general pardon (title of each given). The Commissioners to set forth these in both houses of Parliament, and, when they are passed, proclaim that offenders may have pardons for reasonable fines to be assessed for the King's best profit. The Commissioners may join the Deputy with them. All fees to be paid by the Vice-treasurer, and, being paid, will leave, according to letters sent from the Council there, 4,000l. Irish. The Treasurer to account before the Deputy Chancellor, High Treasurer (or two of them) and barons of the Exchequer, and any surplus to be laid up in a chest in Dublin, of which chest the Vice-treasurer shall have a "diverse" key. The Commissioners to examine and sign all receipts and payments heretofore made by the Treasurer. The Chancellor, High Treasurer, Chief Justice, and Master of the Rolls to take monthly musters of all the Deputy's and Treasurer's men. The Vice-Treasurer to visit the garrisons quarterly. Wm, Sayntlowe to have his choice of one of the garrisons not already granted by letters patent with furniture like that limited to Carlingford. Young Dudley likewise to have a garrison. "Certain knowledges called blackrents" which are exacted by Irish rebels to be examined into. Lands which have come to the King by the Act of Suppression and by forfeiture, which now lie much in waste, to be let. O'Brien's Bridge and the tower thereon, which were thrown down last year, are said to be rebuilt and stronger than ever. The negligence of the Deputy and the King's subjects bordering upon the Bridge, in suffering it to be rebuilt, to be inquired into. The opinions of all men of reputation there to be asked as to the best manner of reforming the land. 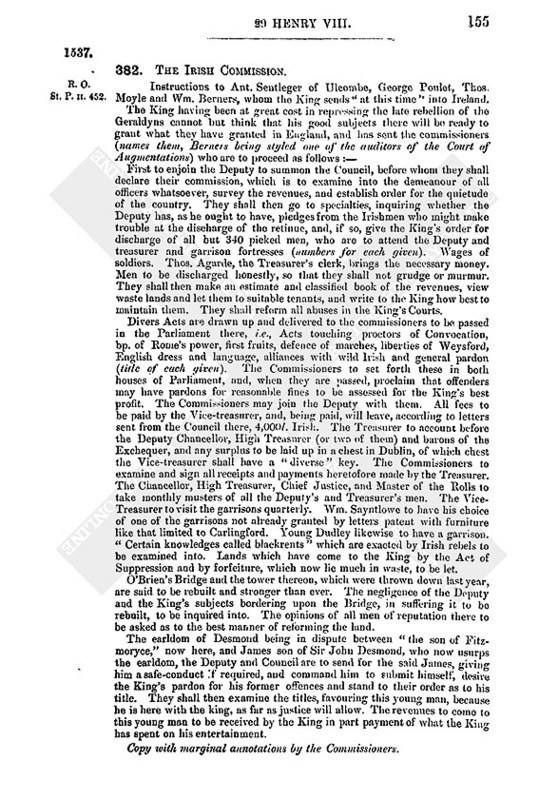 The earldom of Desmond being in dispute between "the son of Fitzmoryce," now here, and James son of Sir John Desmond, who now usurps the earldom, the Deputy and Council are to send for the said James, giving him a safe-conduct if required, and command him to submit himself, desire the King's pardon for his former offences and stand to their order as to his title. They shall then examine the titles, favouring this young man, because he is here with the king, as far as justice will allow. The revenues to come to this young man to be received by the King in part payment of what the King has spent on his entertainment. Copy with marginal annotations by the Commissioners. 2. Imperfect draft of the same corrected and enlarged by Wriothesley. Pp. 35. 3. Draft of the same, with corrections and additions by Wriothesley. Pp. 41. Endd. : The mynute of thinstructions for Ireland. 4. Modern copy of § 1. 5. "Articles to be parcel of the commissioners' instructions, if your lordship think them convenient." 1. That the Act lately certified from hence for the restraint of wool may be enacted without any exception. 2. That the Acts of the 20th of the spirituality and of the clerks of the four courts may be enacted without hindrance of any suit to the contrary, or alteration. 3. As the King will not demand the 20th of the temporalty, the commissioners should declare this to the commons to make them more zealous and conformable. 4. To examine feoffments and see that they are not made to defraud the King of the custody of lands of minors. 5. To survey the King's lands. 6. Divers sue to be gunners in Dublin Castle and lately Richard —— (blank) has a bill signed for 8d. a day by means of some of the Privy Chamber and has sent it thither to be sealed without passing the signet or privy seal contrary to statute. I reckon it more necessary to keep the garrisons on the marches. The Commissioners should inquire whether such a charge be necessary for Dublin Castle, and if not to stop the bill; also to appoint that those having such rooms shall serve personally. 383. [Robert Cowley] to Cromwell. 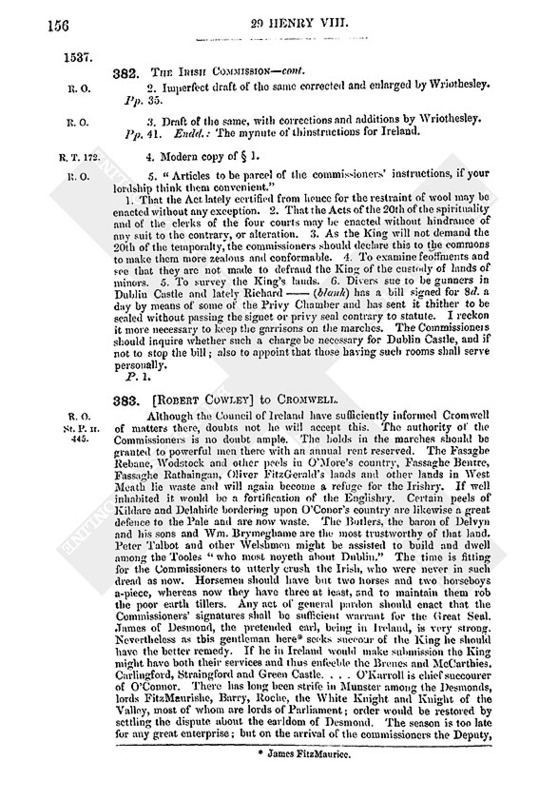 Although the Council of Ireland have sufficiently informed Cromwell of matters there, doubts not he will accept this. The authority of the Commissioners is no doubt ample. The holds in the marches should be granted to powerful men there with an annual rent reserved. The Fasaghe Rebane, Wodstock and other peels in O'More's country, Fassaghe Bentre, Fassaghe Rathaingan, Oliver FitzGerald's lands and other lands in West Meath lie waste and will again become a refuge for the Irishry. If well inhabited it would be a fortification of the Englishry. Certain peels of Kildare and Delahide bordering upon O'Conor's country are likewise a great defence to the Pale and are now waste. The Butlers, the baron of Delvyn and his sons and Wm, Brymeghame are the most trustworthy of that land. Peter Talbot and other Welshmen might be assisted to build and dwell among the Tooles "who most noyeth about Dublin." The time is fitting for the Commissioners to utterly crush the Irish, who were never in such dread as now. Horsemen should have but two horses and two horseboys a-piece, whereas now they have three at least, and to maintain them rob the poor earth tillers. Any act of general pardon should enact that the Commissioners' signatures shall be sufficient warrant for the Great Seal. James of Desmond, the pretended earl, being in Ireland, is very strong. Nevertheless as this gentleman here (fn. n4) seeks succour of the King ho should have the better remedy. If he in Ireland would make submission the King might have both their services and thus enfeeble the Brenes and McCarthies. Carlingford, Straingford and Green Castle. … O'Karroll is chief succourer of O'Connor. There has long been strife in Munster among the Desmonds, lords FitzMaurishe, Barry, Roche, the White Knight and Knight of the Valley, most of whom are lords of Parliament; order would be restored by settling the dispute about the earldom of Desmond. The season is too late for any great enterprise; but on the arrival of the commissioners the Deputy, Ossory, and the English Pale should "peruse" the Irishry of the marches and exact pledges to keep the peace until a certain month next year. "Galloglahes" are a kind of "Sowchynners" (Swiss) who serve for wages: not eight in 200 of them are gentlemen and all the rest are "sklawes" gathered out of the Irishry, whose masters have some gain by them. They are untrustworthy. The lords marchers ought to retain their own and keep captains for them. Ossory would build and inhabit in five or six places upon the MacMorrowes and Kevanaghes if the King would do the like in O'Drone and McMorrowes country adjoining. This might be done by the present army without alarming the other Irishry. Has before delivered Cromwell books of a scheme for a general reformation. The English inhabitants would gladly assist in building peels. The poor English earth tillers in the Pale, who cannot live in such penury and misery as the Irish are replaced, through the greed of their lords, by Irish tenants who neither speak English nor wear cap nor bonnet. Such as have March lands should be bound to serve with a certain number of men. Victuals have been very dear in Dublin and Waterford this year past, by reason of the abode of the army there: it (the army) should be distributed in holds about the country. 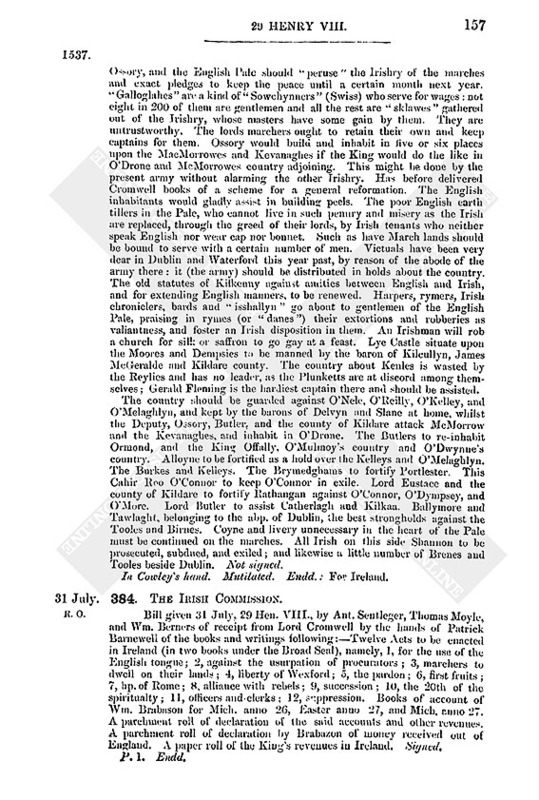 The old statutes of Kilkenny against amities between English and Irish, and for extending English manners, to be renewed. Harpers, rymers, Irish chroniclers, bards and "isshallyn" go about to gentlemen of the English Pale, praising in rymes (or "danes") their extortions and robberies as valiantness, and foster an Irish disposition in them. An Irishman will rob a church for silk or saffron to go gay at a feast. Lye Castle situate upon the Moores and Dempsies to be manned by the baron of Kilcullyn, James McGeralde and Kildare county. The country about Kenles is wasted by the Reylies and has no leader, as the Plunketts are at discord among themselves; Gerald Fleming is the hardiest captain there and should be assisted. The country should be guarded against O'Nele, O'Reilly, O'Kelley, and O'Melaghlyn, and kept by the barons of Delvyn and Slane at home, whilst the Deputy, Ossory, Butler, and the county of Kildare attack McMorrow and the Kevanaghes, and inhabit in O'Drone. The Butlers to re-inhabit Ormond, and the King Offally, O'Mulmoy's country and O'Dwynne's country. Alloyne to be fortified as a hold over the Kelleys and O'Melaghlyn. The Burkes and Kelleys. The Brymedghams to fortify Portlester. This Cahir Reo O'Connor to keep O'Connor in exile. Lord Eustace and the county of Kildare to fortify Rathangan against O'Connor, O'Dympsey, and O'More. Lord Butler to assist Catherlagh and Kilkaa. Ballymore and Tawlaght, belonging to the abp. of Dublin, the best strongholds against the Tooles and Birnes. Coyne and livery unnecessary in the heart of the Pale must be continued on the marches. All Irish on this side Shannon to be prosecuted, subdued, and exiled; and likewise a little number of Brenes and Tooles beside Dublin. Not signed. In Cowley's hand. Mutilated. Endd. : For Ireland. Bill given 31 July, 29 Hen. VIII., by Ant. Sentleger, Thomas Moyle, and Wm. 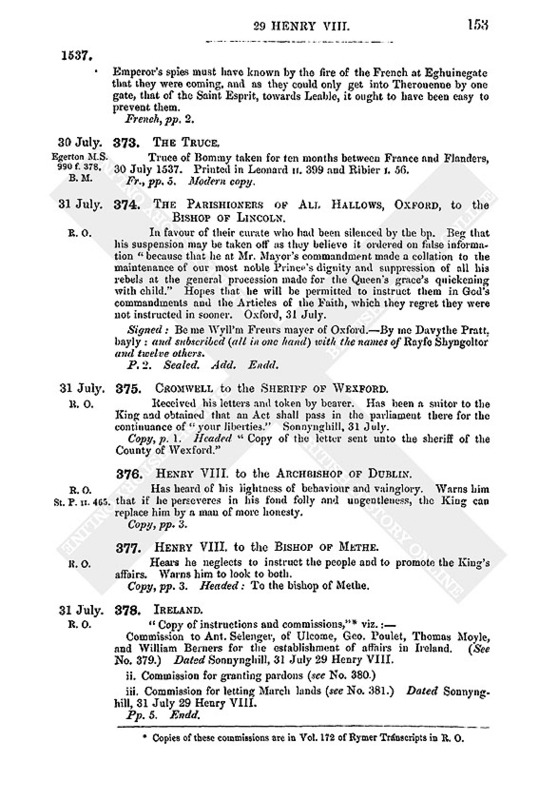 Berners of receipt from Lord Cromwell by the hands of Patrick Barnewell of the books and writings following:—Twelve Acts to be enacted in Ireland (in two books under the Broad Seal), namely, 1, for the use of the English tongue; 2, against the usurpation of procurators; 3, marchers to dwell on their lands; 4, liberty of Wexford; 5, the pardon; 6, first fruits; 7, bp.of Rome; 8, alliance with rebels; 9, succession; 10, the 20th of the spiritualty; 11, officers and clerks; 12, suppression. Books of account of Wm. Brabason for Mich. anno 26, Easter anno 27, and Mich. anno 27. A parchment roll of declaration of the said accounts and other revenues. A parchment roll of declaration by Brabazon of money received out of England. A paper roll of the King's revenues in Ireland, Signed. 385. Henry VIII. to Lord Leonard Grey. Sends Ant. Selenger of Ulcome, Geo. Poulet, Thos. Moyle, and John Barnes as commissioners. Thanks for services against Ochonour. 386. Henry VIII. to the Deputy and Council of Ireland. Sends Ant. Selenger of Ulcom, George Poulet, Thos. Moyle, and John Barnes, to whom they shall give credence, and whose order they shall obey. Order to assist, them in every way. Pp. 3. Copy, headed by Wriothesley: "To the Deputy and the Council." 2. Rough draft of the above in Wriothesley's hand. 387. Henry VIII. to the Vice-Treasurer of Ireland. 388. Henry VIII to the Lords of Parliament in Ireland. Sends by the commissioners certain things to be concluded in Parliament. Requires them each to conform himself to the King's pleasure, and if any one will not, "we shall look so upon him with our princely eye as his ingratitude therein shalbe little to his comfort." P. 1, in a later hand. ii. The same to the Commons House. Pp. 2, in a later hand. 2. Modern copies of the above. Pp. 2. 3. 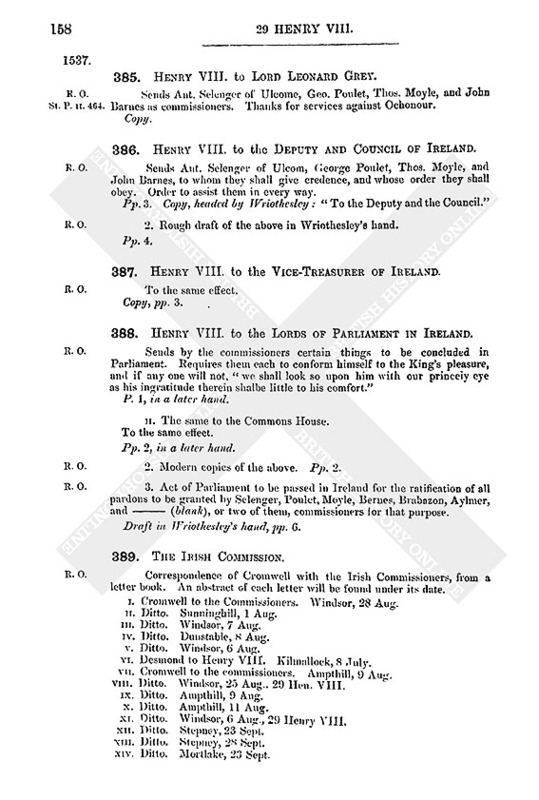 Act of Parliament to be passed in Ireland for the ratification of all pardons to be granted by Selenger, Poulet, Moyle, Bernes, Brabazon, Aylmer, and —— (blank), or two of them, commissioners for that purpose. Draft in Wriothesley's hand, pp. 6. Correspondence of Cromwell with the Irish Commissioners, from a letter book. An abstract of each letter will be found under its date. i. Cromwell to the Commissioners. Windsor, 28 Aug.
ii. Ditto. Sunninghill, 1 Aug.
iii. Ditto. Windsor, 7 Aug.
iv. Ditto. Dunstable, 8 Aug.
v. Ditto. Windsor, 6 Aug.
vi. Desmond to Henry VIII. Kilmallock, 8 July. vii. Cromwell to the commissioners. Ampthill, 9 Aug.
viii. Ditto. Windsor, 25 Aug., 29 Hen. VIII. ix. Ditto. Ampthill, 9 Aug.
x. Ditto. Ampthill, 11 Aug.
xi. Ditto. Windsor, 6 Aug., 29 Henry VIII. xii. Ditto. Stepney, 23 Sept.
xiii. Ditto. Stepney, 28 Sept.
xiv. Ditto. Mortlake, 23 Sept.
390. John Hutton to Cromwell. News came this afternoon of the conclusion of a 10 months' truce—terms yet unknown. Great murmuring among the men of war—especially the High Almains. The lord of Brederode protested he would not forsake his men till summer were past, showing that he meant to make war against the duke of Holst in favour of King Christian who is still a prisoner. He said he was sure 7,000 or 8,000 in the camp would go with him on that enterprise without a penny. Thinks the truce was taken only for lack of money and will be injurious to these parts. Before Turwyn, 31 July. 391. Queen Mary of Hungary to the Bailly, Mayor, and Echevins of Aire. Notwithstanding the successes of the Emperor's army before Therouenne and elsewhere, a truce has been concluded by the intervention of neutrals, according to the enclosed billet. Orders them to publish it. Has disbanded the army and provided for the pay of the men, for which she gives instructions. St. Omer, 31 July, 1537. Fr., p. 1. Copy. Endd. The proclamation of the trewes. ii. Note of publication of the truce at Aire, 1 August, 1537. As the King has given the keeping of Bamborough castle to the bearer, Master Horseley, and his Grace is informed that it is in great decay, his pleasure is that your Lordship cause one or two of the Council there to ride thither and report what repairs are needful to make it habitable. Draft, in Wriothesley's hand, p. 1. Endd. 393. Sir John Dudley, Vice-Admiral. 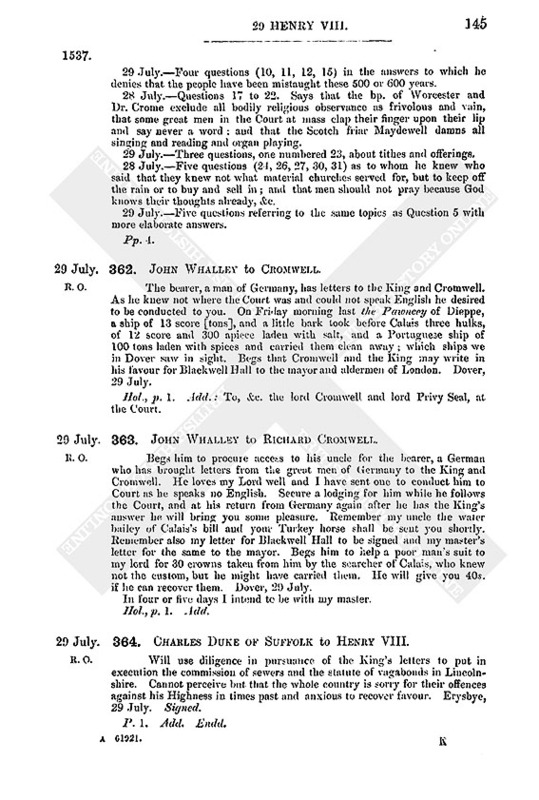 Instructions for Sir John Dudley "[whom the King's Grace] sendeth to the sens as h[is Vice Admiral] at this time for the purposes ..."
Owing to the complaints of English merchants of depredations by ships of war as well of Biscay, Spain and the Low Countries as of Normandy. Britanny, and elsewhere in the French King's dominions, the King, though he is in league with both powers, sends Sir John Dudley his Vice-Admiral to sea with certain ships. They shall get ready and "at their being v ... keep their course and trade between the Downs .... the coast westward by the Isle of Wight to the lan .. called St. Michael's Mount as as the wind [shall] serve, and so off and on between Hushant [and] Sylly, and once to look to Londaye and to the [mouth] of Savern, and from thence to return, and so to k[eep the] Narrow Sees, unless some special occasion shall move a[nd] enforce them to leave the set course before expressed;" in which case their course is left to Dudley's discretion. He is to have a good eye to the succour of English merchants, and if they meet any men of war, French or Imperial, whom they have reason to suspect, of spoiling English subjects as chiefly they of France have lately done, they shall first consider their own power and do what they can to apprehend them without danger. And if they meet with any merchant man French or Imperial, who under colour of [traffic] has robbed the King's subjects, they shall see that he be punished as a pirate. For both sides have used themselves towards the King with such extremity that his honor can no longer suffer it. Sir John is to write his proceedings to the King from time to time. Draft, with corrections by Wriothesley, pp. 6. Mutilated. 394. John Rok to Cromwell. Sends copies of the obligation wherein the city of Lubeck is bound to the King for 3,333l. 6s. 8d. His master (fn. n5) has licensed him for this fortnight to visit his friends in the country, and chiefly because this quarter is so sore visited and infected. Will forbear till ho knows Cromwell's pleasure. Tuesday morning. Hol., p.1. Add. : Lord Privy Seal. Sealed. Endd. : July. Letters of the King's own hand—Letters to the Dauphin, the Great Master, M. de Guise, my lord of Winchester; my lord's letters to my lord of Winchester; the instructions signed; letters to the lord deputy of Calais and my lord Chamberlain for Barlo. P. 1. Endd. : The note of Mr. Knevet's despatch into France. 396. Ric [Sampson], Bp. of Chichester, to Wriothesley. Asks his favour for his kinsman Frevell, the bearer, who wants letters of commendation from "my good lord" [Cromwell] to the prior of Ely for a certain vacant room. Cannot wait on him for the reason Wriothesley knows. Monday morning at my poor lodging in the Stronde. Hol., p.1. Add, Endd. The bisshopp of Chester (sic). 397. John Thomson, Master of the Maison Dieu, to Cromwell. Before Christmas last I showed your lordship, at the Rolls, the King's money was not so well spent as might be; desiring leave to choose 6 or 7 score labourers, with 10 tumbrels and 8 boats and 120l. or 140l., with which I promised as good service as 300 or 400 men then did. Was allowed to do so and in 2 months the Easterly jetty of the King's device was set forth 6 score "foots" and partly filled. Then the Comptroller advertised me to "mell" no further, but wait till Mr. Candysshe came, who discharged me, to the danger of the works "and cause that whose (ooze) pust and filth hath entered the harbour." The Easterly jetty might have been finished ere this and before any "wose, pust or prebiles" had entered. As it is now time of herring fishing, please let it be finished. If it does not please the King I will spend all I have to take it down again. If your Lordship think I can do service, I beg I may not be troubled with other men's commands, which only waste the King's treasure, as proved in the last 6 or 7 months. Where it is said that I and William Legeant, mariner, reported to the King at Hampton Court much untruth concerning the jetties, harbours, and putting back of "preble stones"; between the East North East jetty head and the foreland of St. Margaret's there shall be slack water 7 fathoms without stream or tide. Such a harbour would command the Narrow Seas. Offers to prove his words, if let alone. Devor. Signed. Pp. 2. Add. : Lord Cromwell. Endd. 398. The Earl of Northumberland's Lands. "A Remembrance of the decrease of the late earl of Northumberland's lands in Cumberland, Northumberland, and Yorkshire; and also of increase that may be made of the same lands." First, the earl of Sussex had of the late earl of Northumberland lands in Norfolk and Suffolk worth 96l. a year in exchange for the third part of Egremont, Cumbld., worth 36l. 12s. 8d.—a clear loss of 59l. 7s. 4d. a year. Yet it was conditioned by Act of Parliament that if Northumberland died without issue male, Egremont should revert to the earl of Sussex, who therefore now has both. Md. the earl of Sussex owed to the old Earl of Northumberland 50l. as appears by bill. Sir Thos. Wharton has of the earl of Northumberland in tail male the herbage of Cockermouth park, &c. for 26s. 8d. a year, which is worth 36l. 12s. 1d. ; also a free annuity of 100 mks. allowed this 10 years; and also the towns of Great Browghtton, Little Browghton, Dean, Wynffell, Birteby, and Calbeke Underfell, parcel of the. honour of Cockermouth, for 72l. 6s. 7d., the accustomed rent being 73l. 19s. 11d. ; and the said annuity of 100 mks. 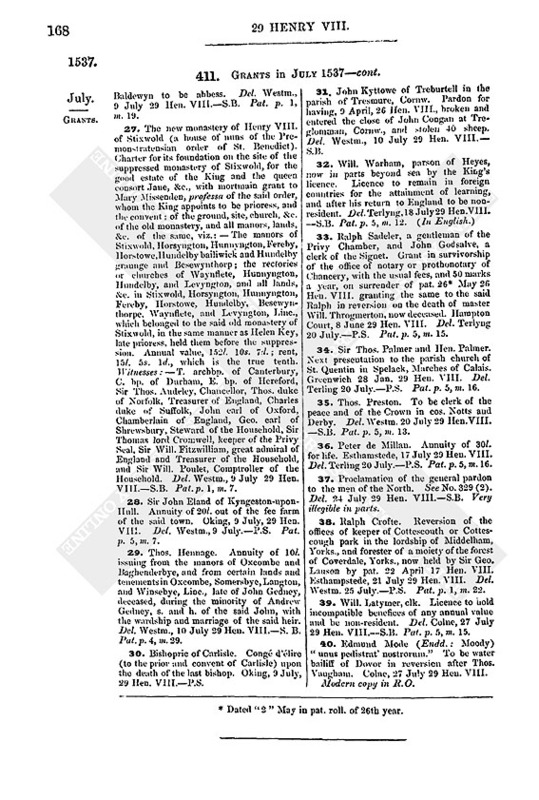 is deducted out of the rent of these 6 towns which are thus severed from the honour of Cockermouth; also the lieutenantship of Cockermouth and constableship of Egremont; and also the manors of Helley and Catterton, Yorks. for nothing, though worth 65l. 14s. 9 1/2d. a year, and containing woods worth 1,000 mks. Sir Thomas Wharton has also to him and his heirs the farmhold of Exton beside Tadcaster, worth 26s. 8d., never allowed. Sir Reynold Carnaby has the dam of Ovingham for 66s. 8d. a year, though worth 110l., a decrease of 106l. 13s. 4d. "after the rate it was in the old Earl's time." Sir Reynold has also the manor of Corbrige and wood called Depden and the park of Langley (values and rents given). Where Sir Reynold has the dam of Ovingham, and one Fishe that of Warkworth, paying for both 23l. 6s. 8d., if their years were redeemed and the dams made with stone it would be 200 marks or 100l. a year at least; for now every third or fourth year it costs for repairs 40l. in timber, which can ill be spared in. Northumberland. There is a field of coals called Bitterlaw, 2 miles from Newcastle, now let for 20 mks., which would be worth 100 mks. if the Watergate were won, which might be done for 200 mks. 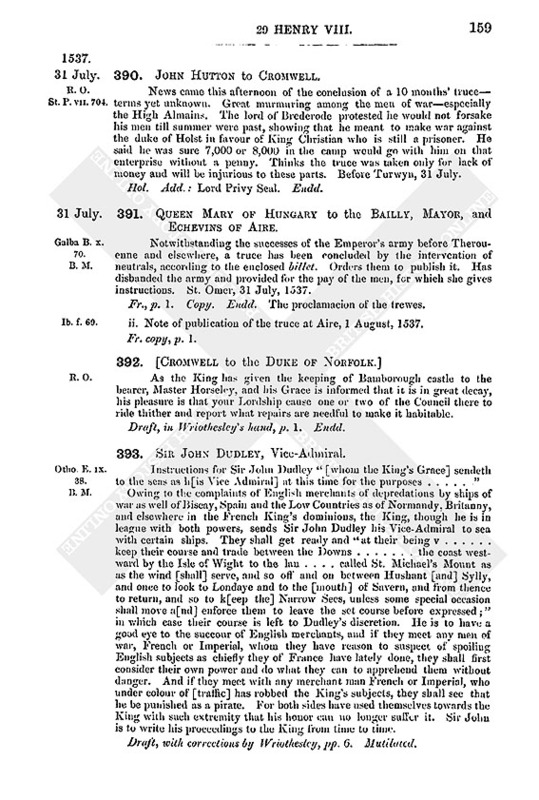 Sir George Lancaster has a fee of 20 mks., &c. out of Warkworth which the King might redeem for a benefice worth 20l. a year. Sir Thomas Johnson has a lease of the herbage of the Little park of Topclyff for 66s. 8d. a year, though worth 10l. Nicasious Hannon has a lease of the Great park of Wressel for 12d. a year, old rent 20s. Cuthbert Carnabe has a lease of herbage of Newsham park at 3s. 4d., old rent 13l. 6s. 8d. 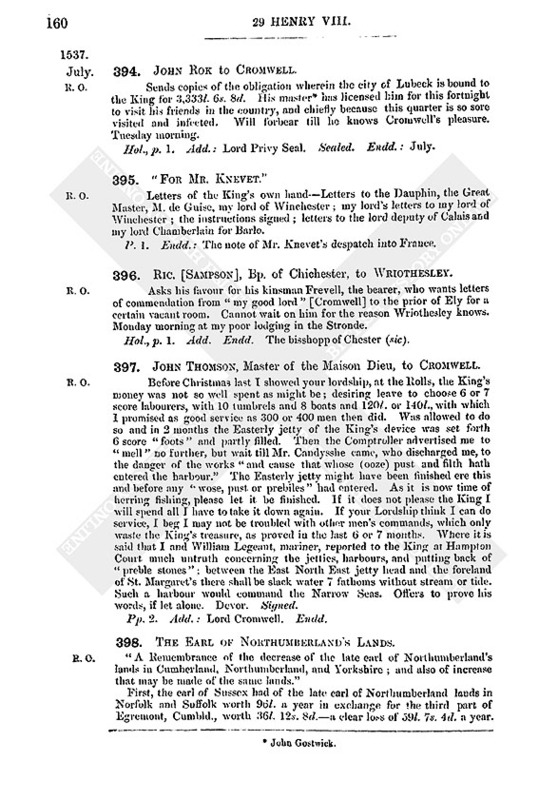 The said Cuthbert has also of the earl's gift the lordship of Hoke in Merchland, worth 10l. a year, for which the Earl gave Sir Edw. Semer 17l. worth a year of the Pounyngs' lands in exchange. There belongs to the manor of Lekingfelde a "care" called Arham Care, wherein are many breeding swans and good fishing, which was reserved for the Earl's pleasure and may now be let by the King for 20l. There are supposed to be within the honour of Cockermouth mines of gold, silver, and lead, which divers persons there are willing to work if the King will give them a third part of the tenth part of the profits. Rough map showing "the way from Fulford" which is continued almost in a straight line as "the way to Wressyll" with "the gate" midway near which "the way to Cawood" diverges at right angles, and afterwards takes a bend, where it is marked "The way to Cawood, and here my lord was at the fray and with(?) ——" A corn field, two rye fields, "green lesnes" and a hedge are also marked. 400. Ric. Bowier alias Stirley to Cromwell. Reminds Cromwell of his promise to move the King in his behalf. 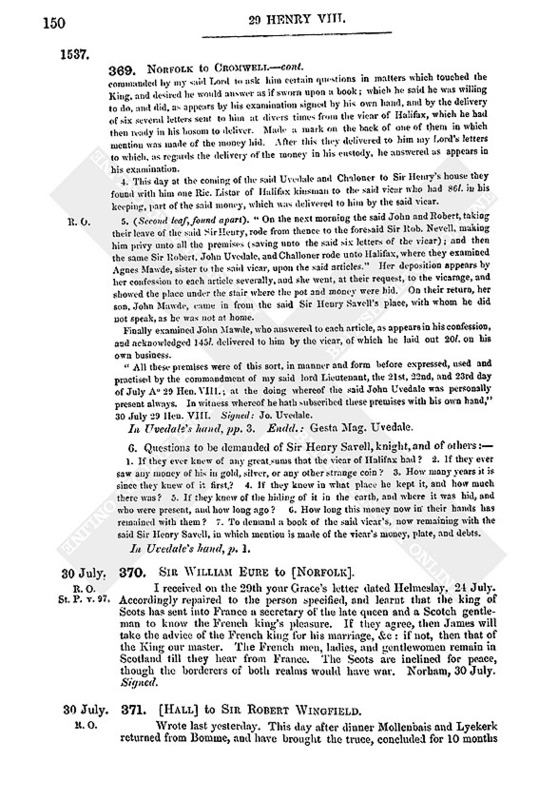 Twenty-eight years ago, being of counsel with the house of Welbeck, in reward for his exertions to obtain the exemption of the "Premonstratens" Order in England from their head house in France, he was made registrar and scribe to the Order, with fees of 40s. and costs at every election of an abbot, and 6s. 8d. at every visitation of any of their 30 houses, besides a yearly fee of 22l. 16s. 8d. from the whole Order. He had also 40s. fee for the keeping of Fosse by patent of the late lord Darcy. All these he has lost, and he has a wife and children to support. Begs an allowance of monastic lands in the city of York. Hol., p. 1, broad sheet. Add. at the head: To &c, Sir Thomas Cromwell, knt., lord Cromwell, lord Privy Seal. Various portions of the Bishops' Book on the Sacraments, in different hands. At p. 65 are the signatures of Cromwell and of Cranmer and the other bishops and divines: among them "Robertus Aldrige," not then bishop. At pp, 77 and 79 is written in Tunstall's hand, "Bishops' Book." Pp. 135, numbered 21–172 in a volume of theological treatises, some pages being blank. Begins: "As touching Justification, we think it convenient that all bishops and preachers shall instruct and teach the people." Ends: "that we should walk in them." Pp. 17, numbered in the same volume 173–189. 3. "The article concerning the souls of them which be departed this life." Begins: "As touching the souls of them which be departed." Ends: "and other like abuses." Pp. 8 (pp. 191–8 of same volume), with corrections by Henry VIII. 4. Second draft of an article in § I, referring to page 120. Begins. Thirdly we will that all bishops and preachers shall instruct and teach our people. Ends: offences contrary to the laws of God. Pp. 33, numbered 215–249 in another theological volume. 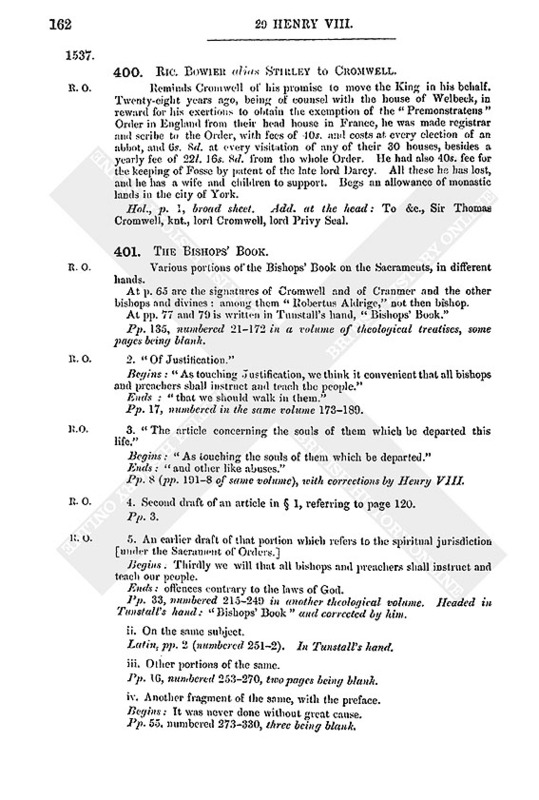 Headed in Tunstall's hand: "Bishops' Book" and corrected by him. ii. On the same subject. Latin, pp. 2 (numbered 251–2). In Tunstall's hand. iii. Other portions of the same. Pp. 16, numbered 253–270, two pages being blank. iv. Another fragment of the same, with the preface. Begins: It was never done without great cause. Pp. 55, numbered 273–330, three being blank. 6. Draft preface and commencement to the work, as in (fn. n7) 5, iv. Marked "A.
Pp. 28, numbered 315–342 in another volume. With many corrections some of which are in Cromwell's hand. 7. Continuation of the same, marked "B. ", relating to the second article in the Creed. Pp. 18, numbered 243–261 in another volume, one page being blank. 8. Another fragment of the same. Draft, much corrected, pp. 2. Endd. by Tunstall: Byshop Bok. 402. "The Institution of a Christian Man." The Convocation's preface addressed to the King, setting forth the plan of the work, and desiring that it may be printed and set forth with the Supreme authority. Signed by Thos. abp. of Canterbury, John bp. of London, Stephen bp. of Winchester, John bp. of Exeter, John bp. of Lincoln, John bp. of Bath, Roland bp. of Coventry and Lichfield, Thos. bp. of Ely, Nic. bp. of Sarum, John bp. of Bangor, Edw. bp. of Hereford, Hugh bp. of Worcester, John bp. of Rochester, Ric. bp. of Chichester, Wm. bp. of Norwich, Wm. bp. of St. David's, Robt. bp. of St. Asaph, Robt. bp. of Llandaff; Edward archbishop of York, Cuthbert bp. of Durham, Robt. bp. of Carlisle; Ric. Wolman, archd. of Sudbury, "Wm. Knight, archd, of Richmond, John Belle, archd. of Gloucester, Edm. Bonner, archd. of Leicester, Wm. Skipp, archd. of Dorset, Nic. Heath, archd. of Stafford, Cuthb. Marshall, archd. of Nottingham, Ric. Curren, archd. of Oxford; Wm. Cliffe, Geoff. Downes, Robt. Oking, Ralph Bradforde, Ric. Smith, Simon Matthews, John Pryn, Wm. Buckmaster, Wm. May, Nic. Wotton, Ric. Coxc, John Edmundes, Thos. Robertson, John Baker, Thos. Barret, John Nase, John Tyson, of theology and of law, ecclesiastical and civil, professors. The judgments of [Edw. Lee] (fn. n8) abp. of York, [Tho. Goodrich] bp. of Ely, [Hilsey] bp. of Rochester, [Longland] bp. of Lincoln, my lords of Bangor and Salisbury, (fn. n9) [Stokesley] bp. of London, (fn. n10) [Cranmer] abp. of Canterbury,‡ Dr. Wotton ["sometime dean of Canterbury and York"], Dr. Barbar [sometime advocate in the Arches], Dr. Bell [archdeacon of Gloucester], Dr. Wolman [archdeacon of Sudbury and afterwards dean of Wells], Dr. Marshal [archdeacon of Nottingham], Dr. Cliff [chanter of York, afterwards dean of Chester], Dr. Edmunds [master of Peterhouse, Cambridge], Dr. Downes [chancellor of York], Dr. Marmaduke, [Sampson bishop of Chichester]§, Dr. Robinson, Dr. [Richard] Smith [sometime public professor of divinity at Oxford], Dr. Buckmaster [vice-chancellor of Cambridge in 1528, 1537, and 1538] on the Sacrament of Confirmation. Most of these are in the authors' own handwritings, but not signed. Cranmer's has this postscript in his hand, "Hec respondeo, salvo semper eruditiorum et ecclesie orthodoxe judicio," and a similar postscript follows that of Dr. Barbar. The name of each divine is written at the head of his answers by Wriothesley. Pp. 37. The individual answers vary in length from a few lines to six or eight pages. Apparently a preface to one of Henry's Books, stating his sorrow that any should have been found so malicious as to find fault with the statements already set forth by authority relative to three of the sacraments; and that now the other four having been added, it is the duty of all faithful subjects to receive the same. Ends:—"And finally to endeavor ourselves for a correspondence of our most reverend love again towards his Majesty to purge and suppress all such corrupt and cankered stomachs as in word or deed would malign or attempt that thing that might sound to the dishonor or slander of his most noble person or of any of his honorable and prudent Council." 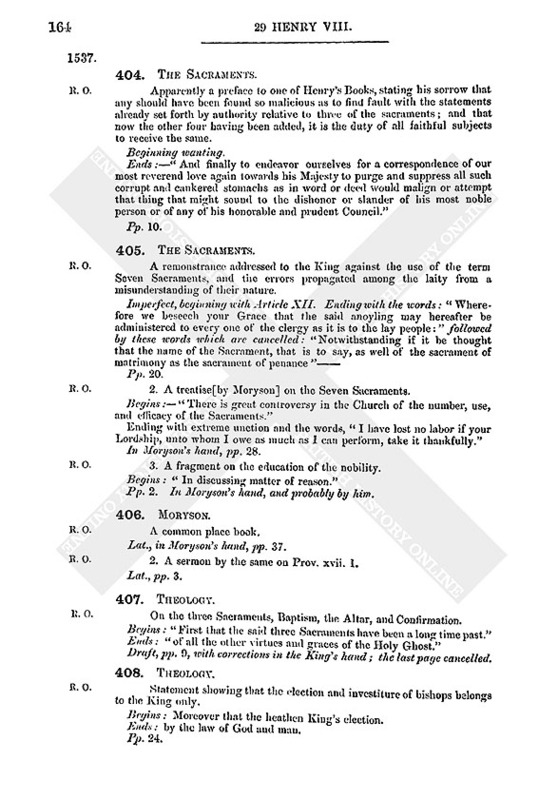 A remonstrance addressed to the King against the use of the term Seven Sacraments, and the errors propagated among the laity from a misunderstanding of their nature. 2. A treatise[by Moryson] on the Seven Sacraments. Begins:—"There is great controversy in the Church of the number, use, and efficacy of the Sacraments." Ending with extreme unction and the words, "I have lost no labor if your Lordship, unto whom I owe as much as I can perform, take it thankfully." In Moryson's hand, pp. 28. 3. A fragment on the education of the nobility. Begins: "In discussing matter of reason." Pp. 2. In Moryson's hand, and probably by him. Lat., in Moryson's hand, pp. 37. 2. A sermon by the same on Prov. xvii. I. On the three Sacraments, Baptism, the Altar, and Confirmation. Begins: "First that the said three Sacraments have been along time past." Ends: "of all the other virtues and graces of the Holy Ghost." Draft, pp. 9, with corrections in the King's hand; the last page cancelled. Statement showing that the election and investiture of bishops belongs to the King only. Begins: Moreover that the heathen King's election. Ends: by the law of God and man. 410. [Foxe Bishop of Hereford] to Bucer. I am bound to you for your kindness to me in Germany and am glad you wished to dedicate your Enarrationes on the Gospels to me. (fn. n12) I must honestly confess, however, that the troubles of these days have not allowed me time to enjoy the reading of them. No doubt you have heard of these tragedies and tumults which have lately been stirred up by wicked men among us and which might have led to great evil had they not been promptly extinguished by the policy of the best of princes (optimi principis), who when he saw all appeased immediately turned his mind to promulgating the Gospel. He therefore charged the bishops and doctors convoked for that purpose to compile certain rudiments of Christianity and a Catechism which I now send you in English and will shortly send you in Latin. Renewed professions of friendship. Begs remembrance to Gaspar Hedio to whom he owes much. If Bucer wishes to hear anything of Britain, he will find the bearer a youth of learning. On the opposite page in other handwritings "Rdo ac multis nominibus suspiciendo fratri Dno. Fabricio Capitoni"——"your assurydly G"; and a draft paragraph from which it appears the bearer is an Englishman of noble family. Begins: "Quanquam to doctissime Bucere, talem esse semper arbitratus sum." 411. Grants in July 1537. 1. Will. Smythe. Grant in fee (for 460l. 6s.) of 14 messuages or tenements in London, viz. 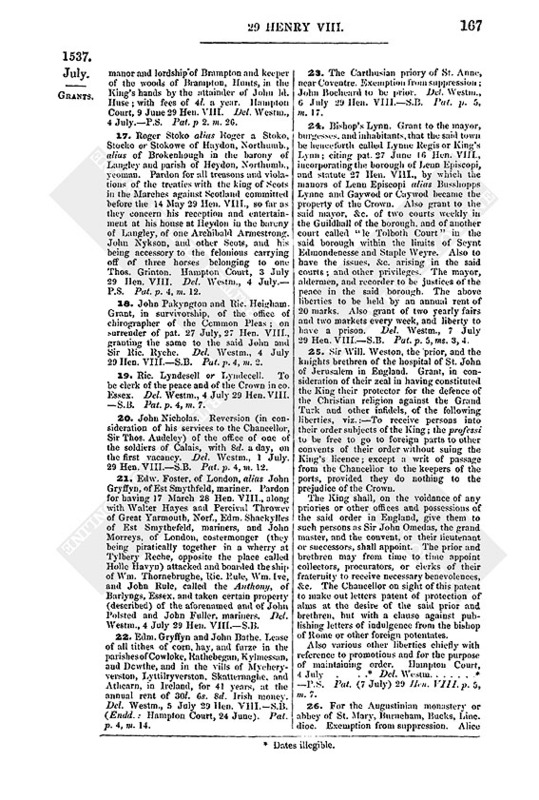 :—one now in the tenure of John Fenne, ironmonger, in St. Laurence Lane, in the parish of St. Laurence, Old Jewry, London, and three others thereto adjoining, now in the several tenures of Will. Southwood, goldsmith. Rob. Longe, mercer, and John Blundell, mercer; another messuage and three others thereto adjoining, now in the several tenures of Ric. Jerveys, mercer, Will. Croks, tallow chandler, and Hen. Adams, barber, in Bowe lane, in the parish of St. Mary de Arcubus (St. Mary le Bow); and seven others, new built, now in the tenure of Sir Ralph Waren, citizen and alderman of London, in Adelstrete, St. Mary Aldermanbury, London, with all houses, shops, solors, &c.; all which belonged to the priory of Elsingspyttyll, London, lately suppressed. Annual value, 37l. 3s. 4d. To be held in as full manner as Roger Potton, the late prior, held the same, by the annual rent of 3l. 14s. 4d., which is a true tenth. Del. Westm., 1 July 29 Hen. VIII.—S.B. Pat. p. 4, m. 33. 2. The Cistercian monastery or abbey of St. Mary, Croxdon, Cov. and Lich. dioc., co. Staff. Exemption from suppression. Thos. Chawner to be abbot. Del. Westm. 2 July 29 Hen. VIII.—S.B. Pat. p. 3, m. 18. 3. John Gostwyk. Licence (for 10 mks.) to alienate the manor or lordship of Wyllyngton alias Wyllyton, Beds, and the chief messuage of the said John in Wyllyngton, lately rebuilt by the said John, and in which he now dwells, to Oliver Leder and John Colbek; and to the said Oliver and John to regrant the same to the said John Gostwyk, and Joan his wife. Westm. 2 July. Pat. 29 Hen. VIII. p. 1, m. 25. 4. Anth. Hamonde. Annuity of 10l. issuing from certain messuages, &c. in Dawne and Pyllyngton, Yorks., late of John Nowell, deceased, during the minority of John Nowell, s. and h. of the said John; with the wardship and marriage of the said heir. Del. Westm. 2 July 29 Hen. VIII.—S.B. Pat. p. 4, m. 23. (2.) Duplicate with slight variations.—S.B. 5. Worcestershire.—Rob. Acton, Ralph Sheldon, and Geo. Willoughby. Commission to make inquisition p.m. on the lands and heir of Roger Wynter; and whether Tiberhunger be parcel of the manor of Cokesey or not, or whether it be a manor of itself; and also whether Eliz. Wynter, late wife of the said Roger, be married since his death or not. Westm., 2 July. Pat. 29 Hen. VIII. p. 3, m. 38 d.
6. Chr. Dysmars. To be clerk of the peace and of the Crown in co. Wilts. Del. Westm., 3 July 29 Hen. VIII.—S.B. Pat. p. 4, m. 7. 7. Hen. Russell. To be clerk of the peace and of the Crown in co. Wore. Del. Westm., 3 July 29 Hen. VIII.—S.B. Pat. p. 4, m. 7. 8. Hen. Champnes. Livery of lands, as brother and heir of Anth. Champnes, deceased, viz., of all which came or shall come to the King's hands by the death of said Anthony or by the death of Joan Champnes, mother of said Henry. Del. Westm., 3 July 29 Hen. VIII.—S.B. Pat. p. 2, m. 2. 9. Cheshire.—Sir Will. Stanley, John Massy of Puddyngton, and Roger Hassall. Commission to make inquisition p.m. on the lands and heir of Thos. 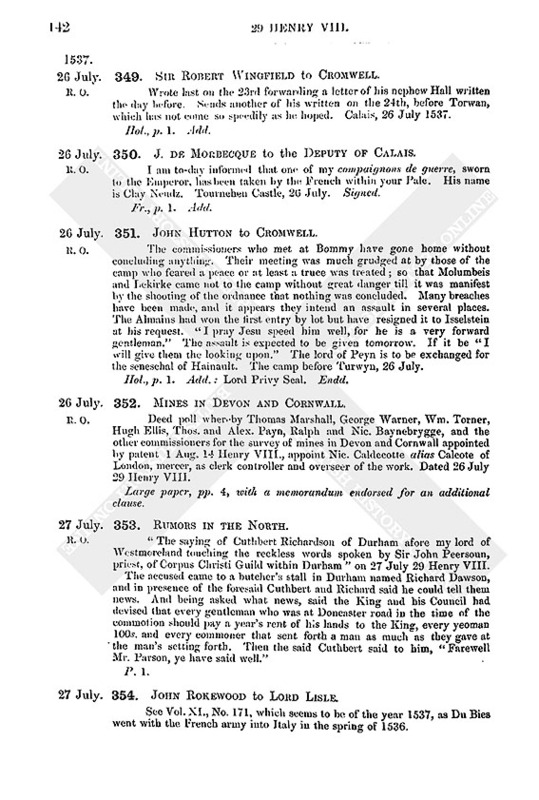 Damport of Henbury. Westm. 3 July. Pat. 29 Hen. VIII. p. 3, m. 38d. 10. Abbey of St. Mary, Brusyard, Norwich dioc, of the order of St. Claire. Exemption from suppression; Mary Page to be abbess. Del. Westm., 4 July 29 Hen. VIII.—S.B. Pat. p. 5, m 6. 11. The Benedictine monastery or priory of St. Mary, Neshnm, Durham dioc. Exemption from suppression; Joan Lawson to be prioress. Del........July 29 Hen. VIII—S.B. Pat. (4 July), p. 5, m. 5. 12. The Augustinian priory of St. Thomas the Martyr, Stafford, Exemption from suppression; Ric. Whyttewell to be prior. Del. Westm., 4 July 29 Hen. VIII.—S.B. Pat. p. 3, m. 17. 13. Sir Edw. Grey lord Powys. Grant in tail male of the site, &c. of the suppressed abbey of St. Mary, Bildwas, Salop; the church, &c. of the said late abbey; and all messuages, &c. in the said site, &c.; the manors or granges called Harnage graunge, Hatton graunge, Gofford graunge, Rucley graunge, Stricheley graunge, Cormeil and Monkmeil graunge, Bilton alias Biketon graunge, Salop; Broketon Ulner graunge, and Watton graunge, Staff. ; Irenbrok graunge, with a water-mill there, Derb. ; and all lands, &c. in Harnage, Hatton, Gofford, Rucley, Stricheley, Cormeil, Monke meal alias Monkemeil, Bilton alias Biketon Ruton Lich, Albrighton, Upton, the town of Shrewsbury, Adney, Reweley, Newporte, Litell Bildewas, Sutton Madok. Ruggs, Shenton, Oldefeld, Kymerton, Riton, Ragedon, Brigenorth, Bildwas. Longedon, and Terne, Salop; Broketon Ulner, and Walton, Staff. 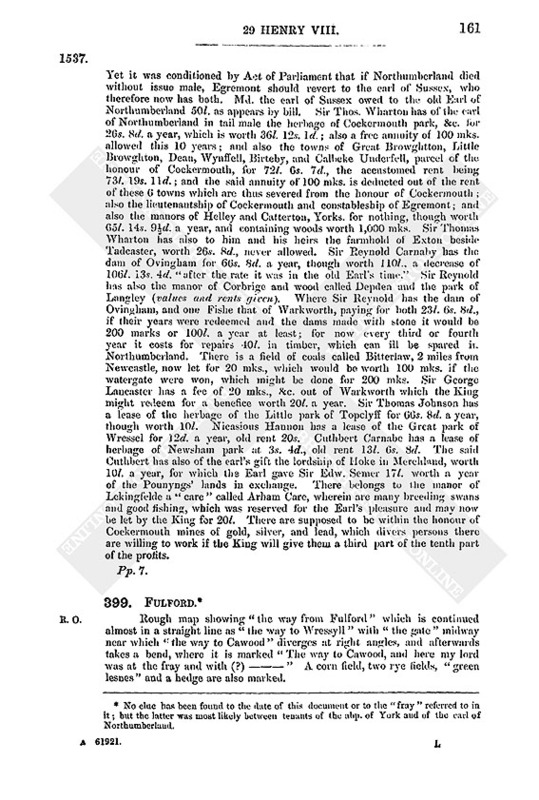 ; and Irenbruk, Derby; the churches and rectories of Leighton, Bildwas and Hatton, with tithes of Hatton, with all chantries, glebelands, &c. belonging to the said churches, rectories, &c.; and all manors, messuages, &c. in the said vills and places belonging to the said abbey, as enjoyed by Stephen, the late abbot, or his predecessors. To hold by the annual rent of 55l. 8s. 8d. to the Court of Augmentations, and be exempt from payment of annuities granted by the convent, i.e., 12l. 6s. 8d., to George earl of Shrewsbury, Will. Shorleton of Appeley, Roger Charleton, Ric. Foster of Willyngton, and John Foster, mercer, to the use of Ric. Emery, formerly abbot there; 6s. 8d. to Thos. Atkynson; 20s. to Will. Charleton; 26s. 8d. to Steph. Peyll; 66s. 8d. to Edw. Laken; and 16l. (granted by the Court of Augmentations) to Stephen Grene, late abbot of Bildewas; 8s. to Geo. Bond, tiler; 3s. 4d. to Will. Wynnyshurste, cooper; and 10s. to a certain barber. Del. Westm. 4 July 29 Hen. VIII.—S.B. Pat. p. 1, m. 6. 14. Ric. Gresham, citizen and merchant, London. Licence to alienate the manors of Estorpe and Magna Bryche and the hundred of Lexden, with 12 messuages and certain acres of land, meadow, &c. in Estorpe and Magua and Parva Bryche, to Sir Thos. Audeley, the Chancellor, and Christina his wife, and the heirs of the said Sir Thomas. Westm., 4 July. Pat. 29 Hen. VIII., p. 5, m. 41. Vacated. 15. Ric. Gresham, citizen and mercer, London. Licence to alienate the manor of Estorpe and hundred of Lexden, Essex, to Sir Thos. Audeley and Christina his wife, and the heirs of the said Thomas. Westm., 4 July. Pat. 29 Hen. VIII., p. 5, m. 42. 16. Philip Wylde, a yeoman usher of the Chamber. To be bailiff and provost of the manor and lordship of Brampton and keeper of the woods of Brampton, Hunts, in the King's hands by the attainder of John Id. Huse; with fees of 4l. a year. Hampton Court, 9 June 29 Hen. VIII. Del. Westm., 4 July.—P.S. Pat. p 2. m. 26. 17. Roger Stoko alias Roger a Stoko, Stocko or Stokowe of Haydon, Northumb., alias of Brokenhough in the barony of Langley and parish of Heydon, Northumb., yeoman. Pardon for all treasons and violations of the treaties with the king of Scots in the Marches against Scotland committed before the 14 May 29 Hen. VIII., so far as they concern his reception and entertainment at his house at Heydon in the barony of Langley, of one Archibald Armestrong, John Nykson, and other Scots, and his being accessory to the felonious carrying off of three horses belonging to one Thos. Grinton. Hampton Court, 3 July 29 Hen. VIII. Del. Westm., 4 July.—P.S. Pat. p. 4, m. 12. 18. John Pakyngton and Ric. Heigham. Grant, in survivorship, of the office of chirographer of the Common Pleas; on surrender of pat. 27 July, 27 Hen. VIII., granting the same to the said John and Sir Ric. Ryche. Del. Westm., 4 July 29 Hen. VIII.—S.B. Pat p. 4, m. 2. 19. Ric. Lyndesell or Lyndecell. To be clerk of the peace and of the Crown in co. Essex. Del. Westm., 4 July 29 Hen. VIII. —S.B. Pat. p. 4, m. 7. 20. John Nicholas. Reversion (in consideration of his services to the Chancellor, Sir Thos. Audeley) of the office of one of the soldiers of Calais, with 8d. a day, on the first vacancy. Del. Westm., 1 July. 29 Hen. VIII.—S.B. Pat. p. 4, m. 12. 21. Edw. Foster, of London, alias John Gryffyn, of Est Smythfeld, mariner. Pardon for having 17 March 28 Hen. VIII., along with Walter Hayes and Percival Thrower of Great Yarmouth, Norf., Edm. Shackylles of Est Smythefeld, mariners, and John Morreys, of London, costermonger (they being piratically together in a wherry at Tylbery Reche, opposite the place called Holle Havyn) attacked and boarded the ship of Wm. Thornebrughe, Ric. Rule, Wm. Ive, and John Rule, called the Anthony, of Barlyngs, Essex, and taken certain property (described) of the aforenamed and of John Polsted and John Fuller, mariners. Del. Westm., 4 July 29 Hen. VIII.—S.B. 22. Edm. Gryffyn and John Bathe. 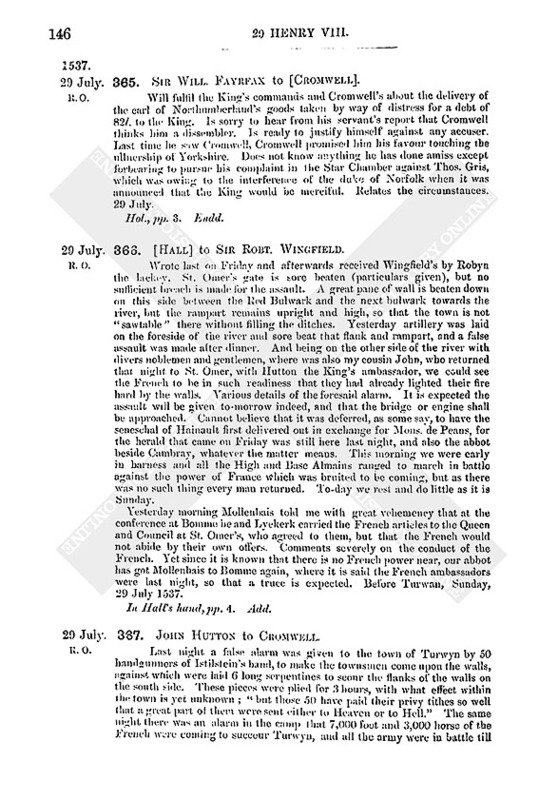 Lease of all tithes of corn, hay, and furze in the parishes of Cowloke, Rathebegan, Kylmessan, and Dowthe, and in the vills of Mycheryverston, Lyttilryverston, Skatternaghe, and Athcarn, in Ireland, for 41 years, at the annual rent of 30l. 6s. 8d. Irish money. Del. Westm., 5 July 29 Hen. VIII.—S.B. (Endd. : Hampton Court, 24 June). Pat. p. 4, m. 14. 23. The Carthusian priory of St. Anne, near Coventre. Exemption from suppression; John Bocheard to be prior. Del. Westm., 6 July 29 Hen. VIII.—S.B. Pat. p. 5, m. 17. 24. Bishop's Lynn. Grant to the mayor, burgesses, and inhabitants, that the said town be henceforth called Lynne Regis or King's Lynn; citing pat. 27 June 16 Hen. VIII., incorporating the borough of Lenn Episcopi, and statute 27 Hen. VIII., by which the manors of Lenn Episcopi alias Busshopps Lynne and Gaywod or Caywod became the property of the Crown. Also grant to the said mayor, &c. of two courts weekly in the Guildhall of the borough, and of another court called "le Tolboth Court" in the said borough within the limits of Seynt Edmondenesse and Staple Weyre. Also to have the issues, &c. arising in the said courts; and other privileges. The mayor, aldermen, and recorder to be justices of the peace in the said borough. The above liberties to be held by an annual rent of 20 marks. Also grant of two yearly fairs and two markets every week, and liberty to have a prison. Del. Westm., 7 July 29 Hen. VIII.—S.B. Pat. p. 5, ms. 3, 4. 25. Sir Will. Weston, the prior, and the knights brethren of the hospital of St. John of Jerusalem in England. 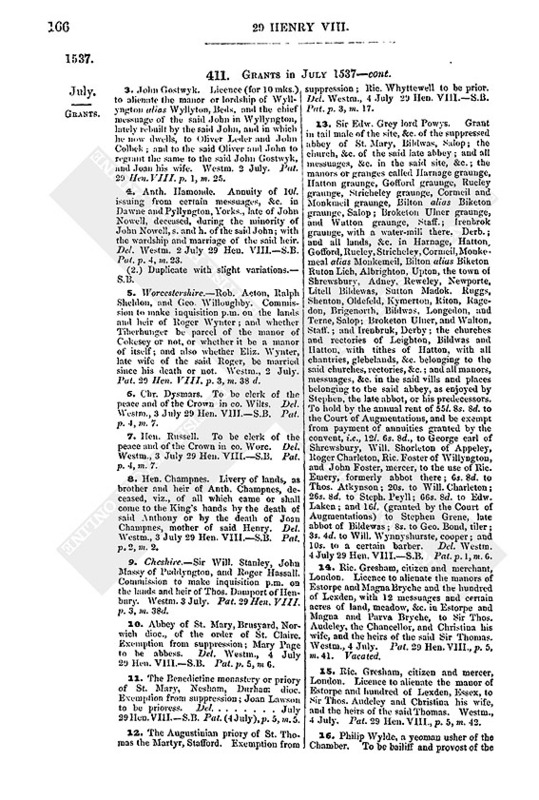 Grant, in consideration of their zeal in having constituted the King their protector for the defence of the Christian religion against the Grand Turk and other infidels, of the following liberties, viz. :—To receive persons into their order subjects of the King; the professi to be free to go to foreign parts to other convents of their order without suing the King's licence; except a writ of passage from the Chancellor to the keepers of the ports, provided they do nothing to the prejudice of the Crown. The King shall, on the voidance of any priories or other offices and possessions of the said order in England, give them to such persons as Sir John Omedas, the grand master, and the convent, or their lieutenant or successors, shall appoint. 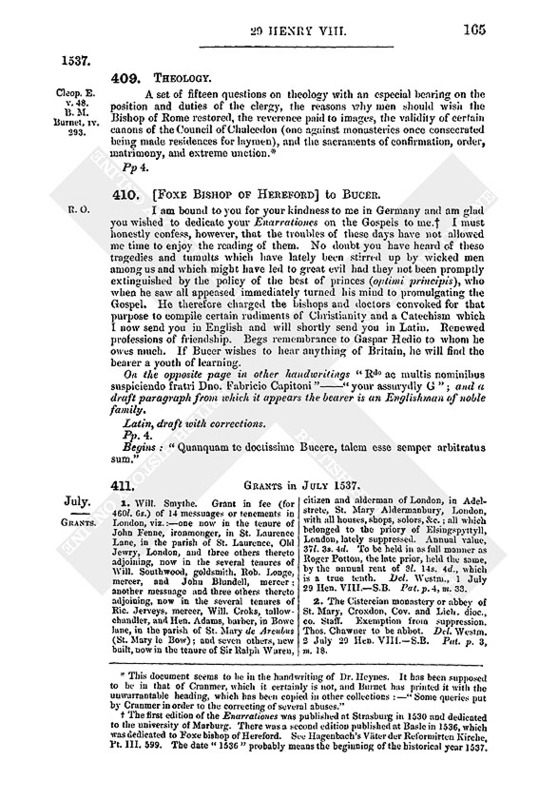 The prior and brethren may from time to time appoint collectors, procurators, or clerks of their fraternity to receive necessary benevolences, &c. The Chancellor on sight of this patent to make out letters patent of protection of alms at the desire of the said prior and brethren, but with a clause against publishing letters of indulgence from the bishop of Rome or other foreign potentates. Also various other liberties chiefly with reference to promotions and for the purpose of maintaining order. Hampton Court, 4 July....... (fn. n13) Del. Westm.......*—P.S. Pat. (7 July) 29 Hen. VIII. p. 5, m. 7. 26. For the Augustinian monastery or abbey of St. Mary, Burneham, Bucks, Line, dioc. Exemption from suppression. Alice Baldewyn to be abbess. Del. Westm., 9 July 29 Hen. VIII.—S.B. Pat. p. 1, m 19. 27. The now monastery of Henry VIII. of Stixwold (a house of nuns of the Premonstratensian order of St. Benedict). Charter for its foundation on the site of the suppressed monastery of Stixwold, for the good estate of the King and the queen consort Jane, &c, with mortmain grant to Mary Missenden, professa of the said order, whom the King appoints to be prioress, and the convent; of the ground, site, church, &c. of the old monastery, and all manors, lands, &c. of the same, viz. :—The manors of Stixwold, Horsyngton, Hunnyngton, Fereby, Horstowe, Hundelby bailiwick and Hundelby graunge and Besewynthorp; the rectories or churches of Waynflete, Hunnyngton, Hundelby, and Levyngton, and all lands, &c. in Stixwold, Horsyngton, Hunnyngton, Fereby, Horstowe, Hundelby, Besewynthorpe, Waynflete, and Levyngton, Linc., which belonged to the said old monastery of Stixwold, in the same manner as Helen Key, late prioress, held them before the suppression. Annual value, 152l. 10s. 7d. ; rent, 15l. 5s. 1d., which is the true tenth. Witnesses:—T. archbp. of Canterbury, C. bp. of Durham, E. bp. of Hereford, Sir Thos. Audeley, Chancellor, Thos. duke of Norfolk, Treasurer of England, Charles duke of Suffolk, John earl of Oxford, Chamberlain of England, Geo. earl of Shrewsbury, Steward of the Household, Sir Thomas lord Cromwell, keeper of the Privy Seal, Sir Will. Fitzwilliam, great admiral of England and Treasurer of the Household, and Sir Will. Poulet, Comptroller of the Household. Del. Westm., 9 July 29 Hen. VIII.—S.B. Pat. p. 1, m. 7. 28. Sir John Eland of Kyngeston-upon-Hull. Annuity of 20l. out of the fee farm of the said town. Oking, 9 July, 29 Hen. VIII. Del. Westm., 9 July.—P.S. Pat. p. 5, m. 7. 29. Thos. Hennage. Annuity of 10l. issuing from the manors of Oxcombe and Baghenderbye, and from certain lands and tenements in Oxcombe, Somersbye, Langton, and Winsebye, Linc., late of John Gedney, deceased, during the minority of Andrew Gedney, s. and h. of the said John, with the wardship and marriage of the said heir. Del. Westm., 10 July 29 Hen. VIII.—S. B. Pat. p. 4, m. 29. 30. Bishopric of Carlisle. Congé d'élire (to the prior and convent of Carlisle) upon the death of the last bishop. Oking, 9 July 29 Hen. VIII.—P.S. 31. John Kyttowe of Treburtell in the parish of Tresmure, Cornw. Pardon for having, 9 April, 26 Hen. VIII., broken and entered the close of John Congan at Treglomman, Cornw., and stolen 40 sheep. Del. Westm., 10 July 29 Hen. VIII.—S.B. 33. Ralph Sadeler, a gentleman of the Privy Chamber, and John God salve, a clerk of the Signet. Grant in survivorship of the office of notary or prothonotary of Chancery, with the usual fees, and 50 marks a year, on surrender of pat. 26 (fn. n14) May 26 Hen. VIII. granting the same to the said Ralph in reversion on the death of master Will. Throgmerton, now deceased. Hampton Court, 8 June 29 Hen. VIII. Del. Terlyng 20 July.—P.S. Pat. p. 5, m. 15. 34. Sir Thos. Palmer and Hen. Palmer. Next presentation to the parish church of St. Quentin in Spelack, Marches of Calais. Greenwich 28 Jan. 29 Hen. VIII. Del. Terling 20 July.—P.S. Pat. p. 5, m. 16. 35. Thos. Preston. To be clerk of the peace and of the Crown in cos. Notts and Derby. Del. Westm. 20 July 29 Hen. VIII.—S.B. Pat. p. 5, m. 13. 36. Peter de Millan. Annuity of 30l. for life. Esthamstede, 17 July 29 Hen. VIII. Del. Terling 20 July.—P.S. Pat. p. 5, m. 16. 37. Proclamation of the general pardon to the men of the North. See No. 329 (2). Del. 24 July 29 Hen. VIII.—S.B. Very illegible in parts. 38. Ralph Crofte. Reversion of the offices of keeper of Cottescouth or Cottescough park in the lordship of Middelham, Yorks., and forester of a moiety of the forest of Coverdale, Yorks., now held by Sir Geo. Lauson by pat. 22 April 17 Hen. VIII. Esthampstede, 21 July 29 Hen. VIII. Del. Westm. 25 July.—P.S. Pat. p. 1, m. 22. 39. Will. Latymer, clk. Licence to hold incompatible benefices of any annual value and be non-resident. Del. Colne, 27 July 29 Hen. VIII.—S.B. Pat. p. 5, m. 15. 40. Edmund Mode (Endd. : Moody) "unus pedistrat' nostrorum." To be water bailiff of Dovor in reversion after Thos. Vaugham. Colne, 27 July 29 Hen. VIII. Modern copy in R. O. 412. Cromwell to Dr. Sandewiche. Has appointed him to preach at Paul's Cross on the 12th Sunday after Trinity, 19 August. Signed. P. 1. Add. : Of Canterbury Coll., Oxford. 413. The Prior of Dunstable to Cromwell. The gentleman usher is at Dunstable and intends to make lodging for the King at the White Horse in Dunstable town, and not in my poor house, which I have made ready to receive him. I beg you will move his Highness to make his lodging with me, or else that you will take up yours here. n2. Copies of these commissions are in Vol. 172 of Rymer Tránscripts in R. O.
n3. So here in some other papers, William Berners in No. 378.
n6. No clue has been found to the date of this document or to the "fray" referred to in it; but the latter was most likely between tenants of the abp. of York and of the earl of Northumberland. n7. Called by Strype "another divine nameless," but he is identified by his handwriting. n8. The names and designations here printed in brackets, though given in Strype as if contained in the document itself, are not in the original. The leaves seem to have been transposed since Strype printed the paper. n9. Strype omits the bp. of Salisbury, who returns a joint answer with Salcote bp. of Bangor. n10. The answers of Cranmer and Stokesley are printed separately in Burnet, IV. 296.
n11. This document seems to be in the handwriting of Dr. Heynes. It has been supposed to be in that of Cranmer, which it certainly is not, and Burnet has printed it with the unwarrantable heading, which has been copied in other collections:—"Some queries put by Cranmer in order to the correcting of several abuses." n12. The first edition of the Enarrationes was published at Strasburg in 1530 and dedicated to the university of Marburg. There was a second edition published at Basle in 1536, which was dedicated to Foxe bishop of Hereford. Sec Hagenbach's Väter der Reformirten Kirche, Pt. III. 599. The date "1536" probably means the beginning of the historical year 1537.
n14. Dated "2" May in pat. roll. of 26th year.